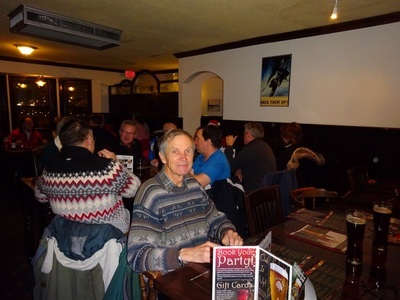 Thanks to Michael and Lisa Solonynko for hosting this year's Winter Bash on 24 January, and to Phil Totten for snapping the photos. 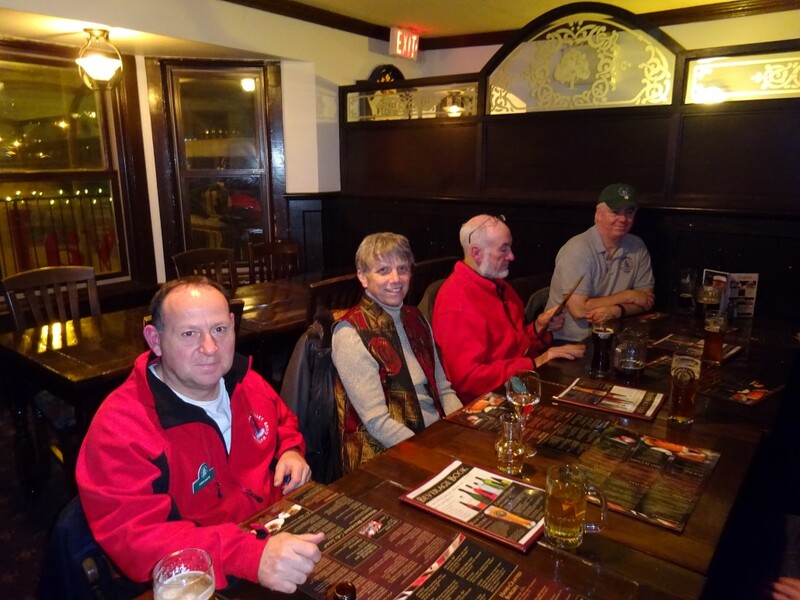 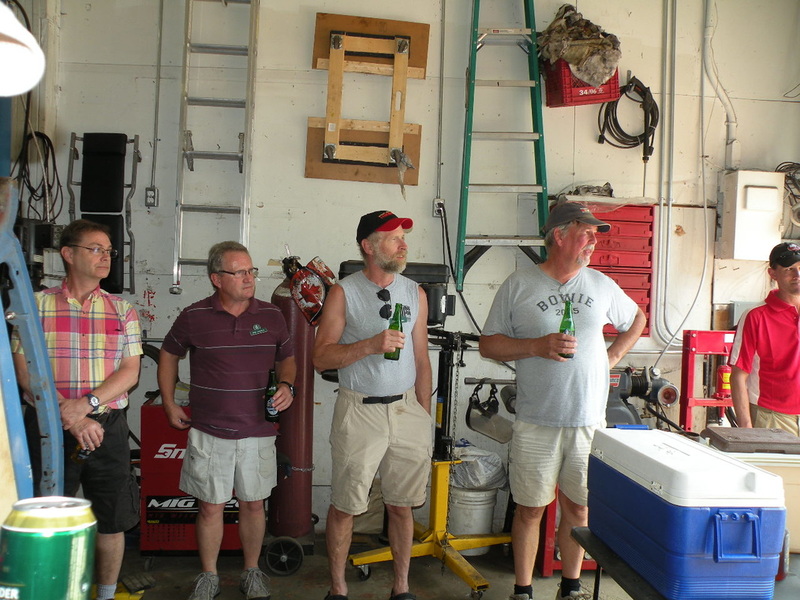 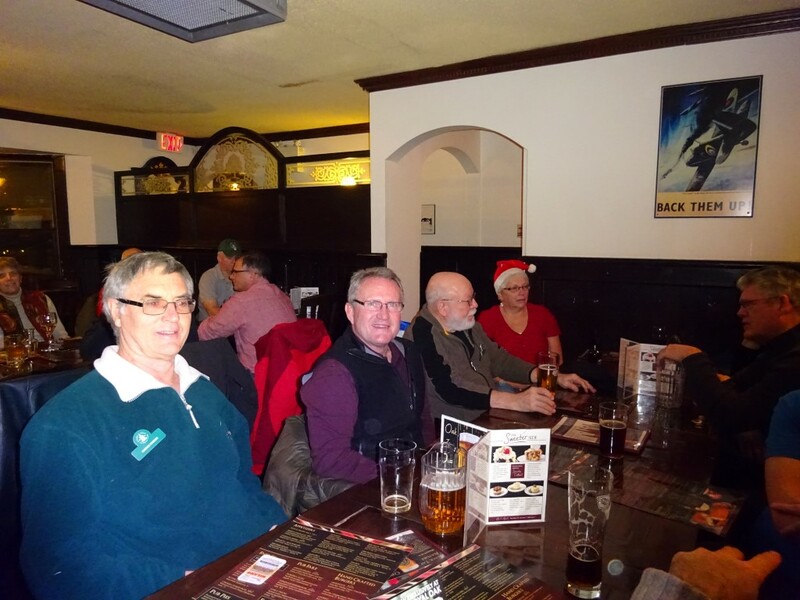 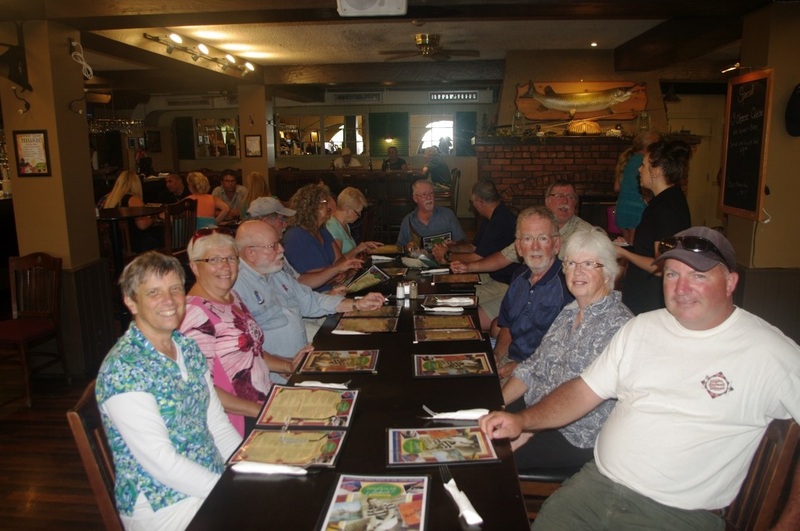 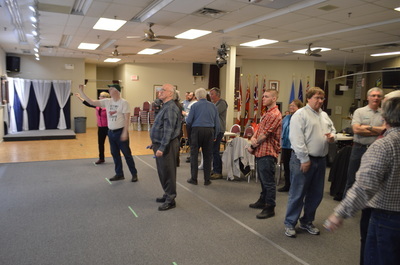 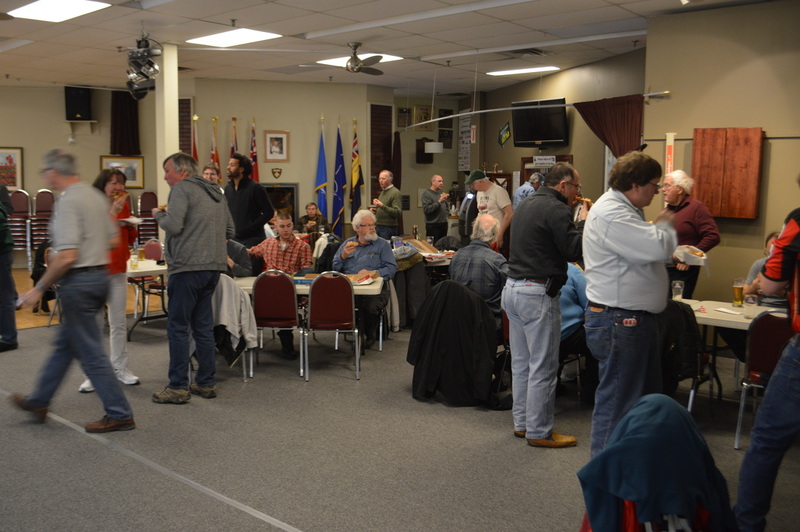 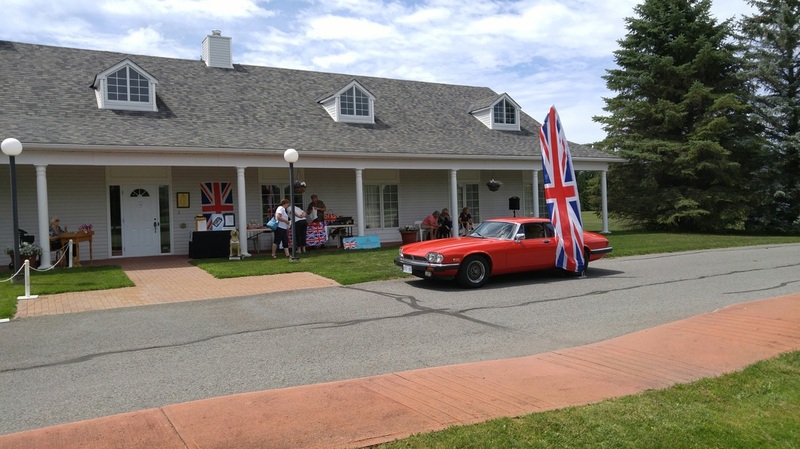 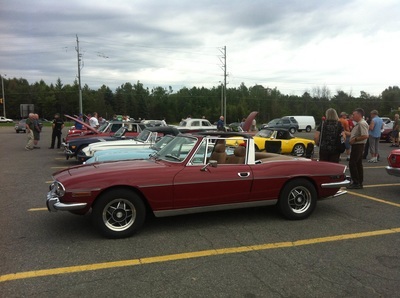 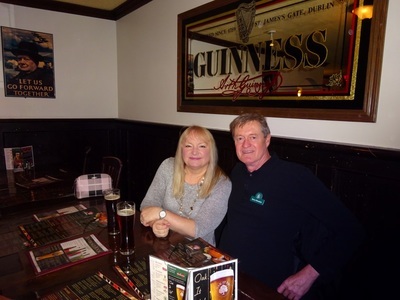 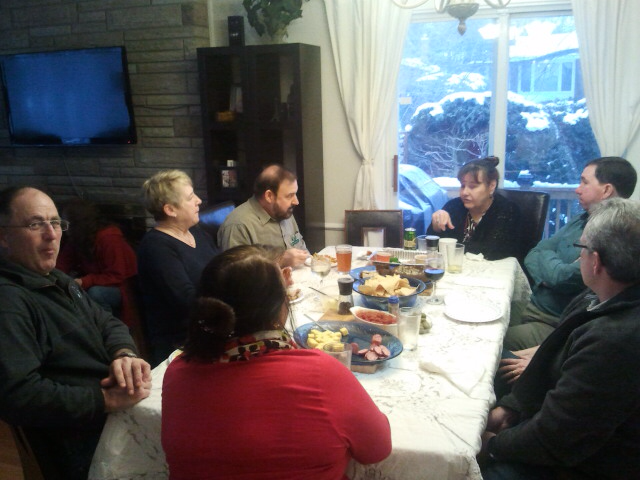 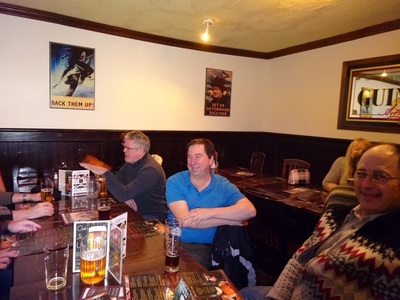 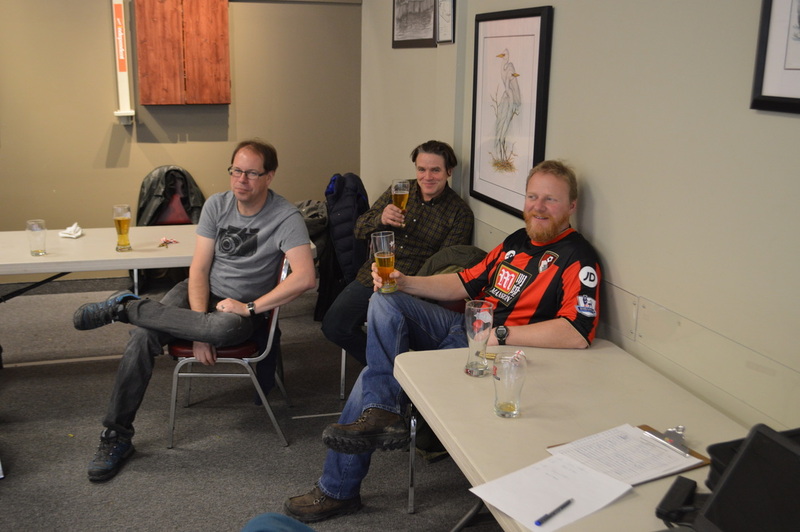 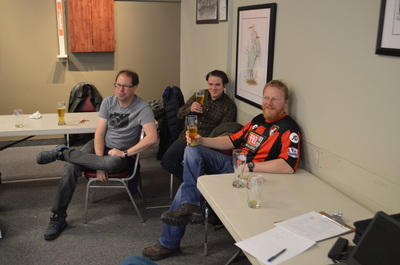 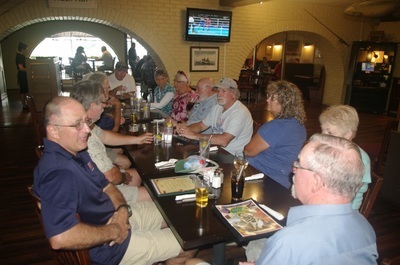 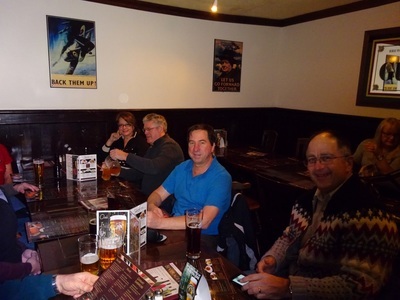 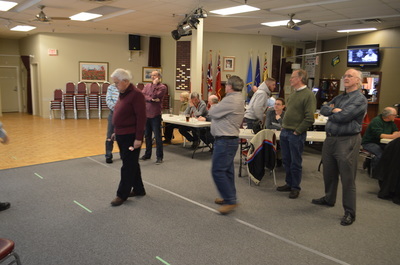 The OVTC once again hosted the Ottawa Jaguar Club and the Ottawa MG Club at the annual darts tournament on 13 February. 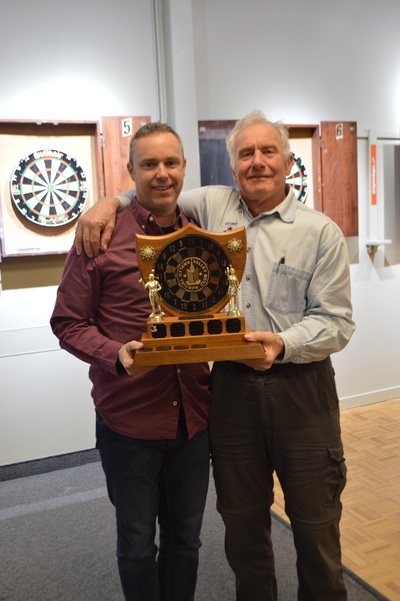 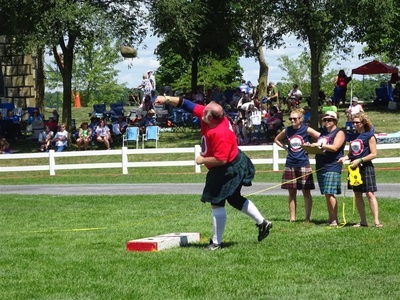 Fourteen teams (a recent record) participated this year with Ivan Wood and Mike Tremblay of OMGC taking home the trophy - if we don't let them win from time to time, they might stop coming :-). 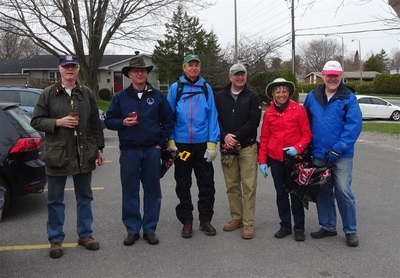 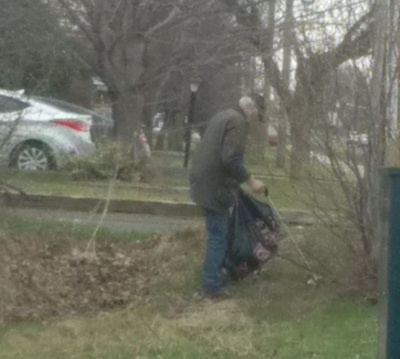 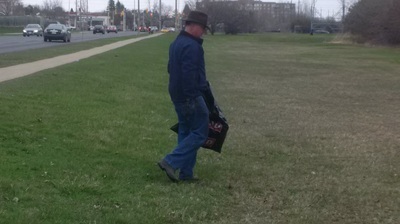 Many thanks to Chuck, Martin, Tony, Mike S., and Marjorie and Mike for lending a hand to the Manordale-Woodvale Community Association for their Clean the Capital initiative this year on 1 May. 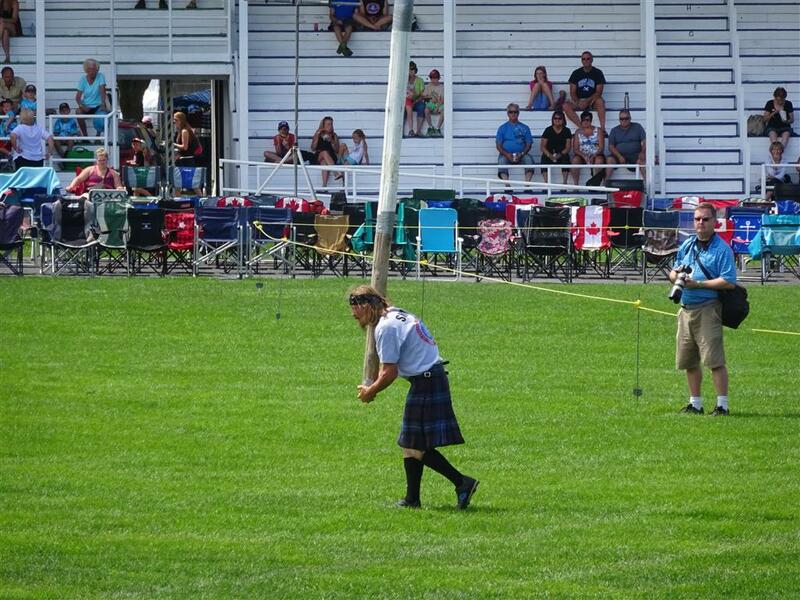 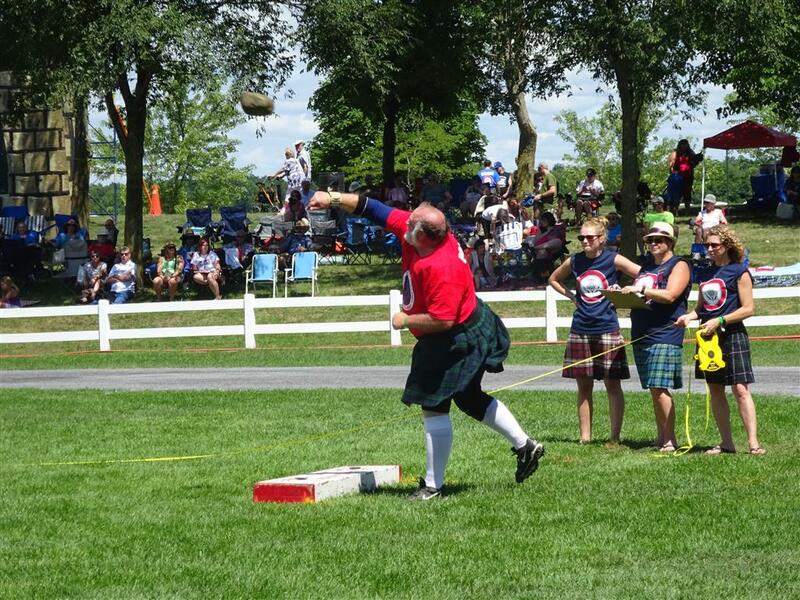 Thanks to Mike S. for the "action" pictures. 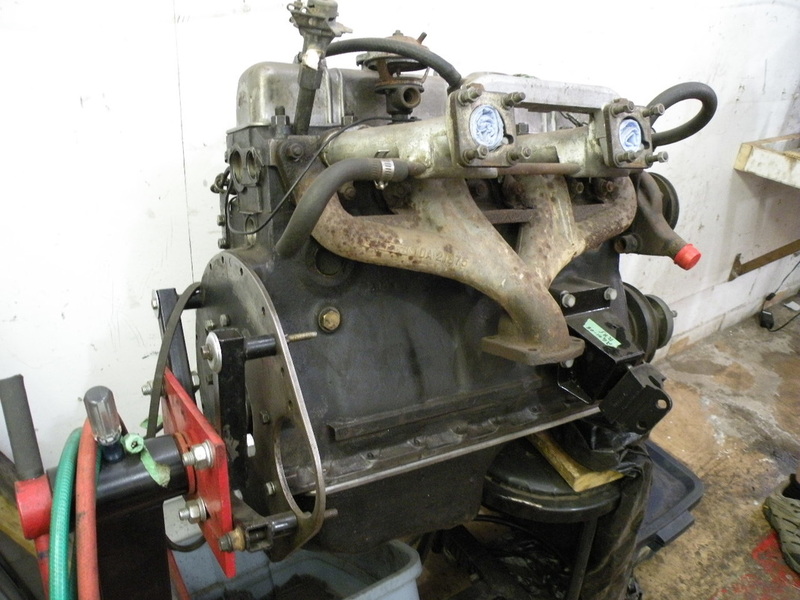 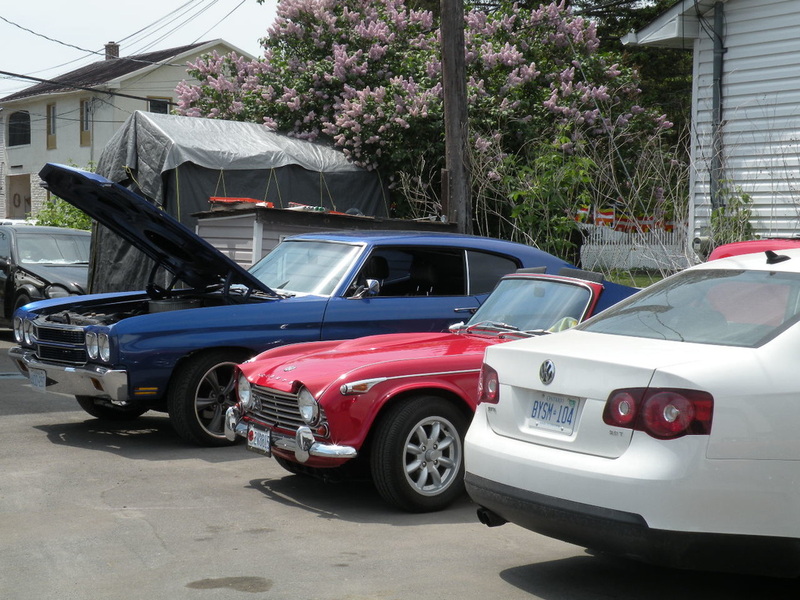 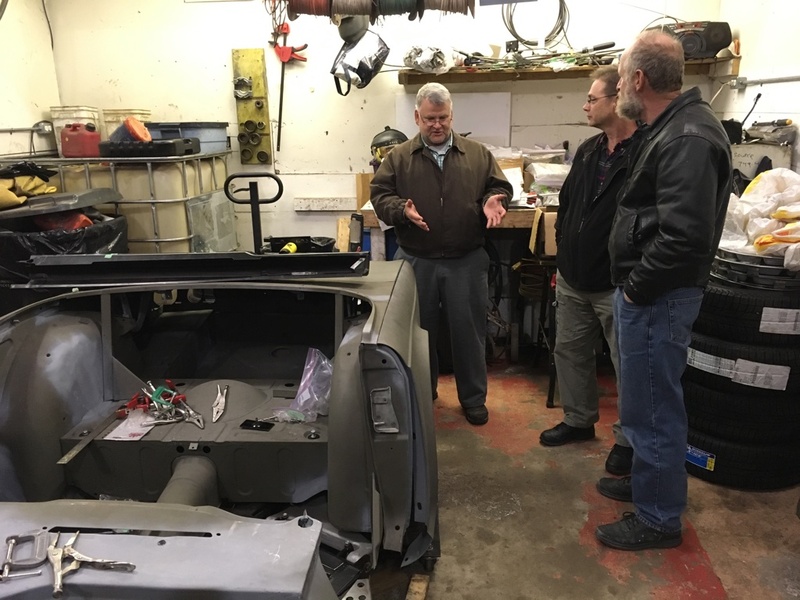 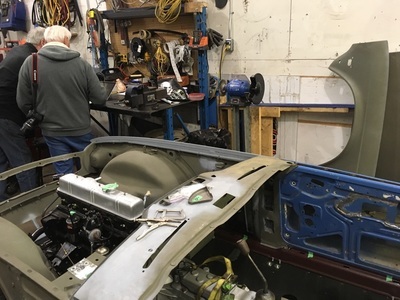 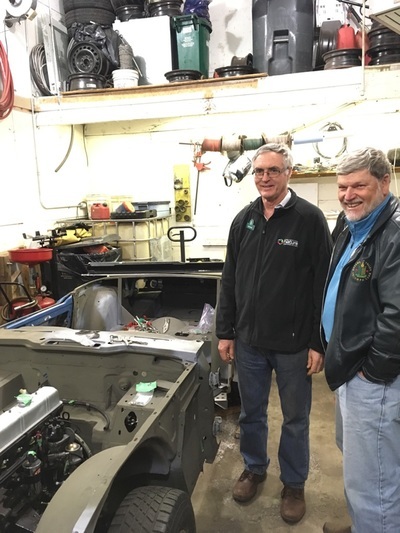 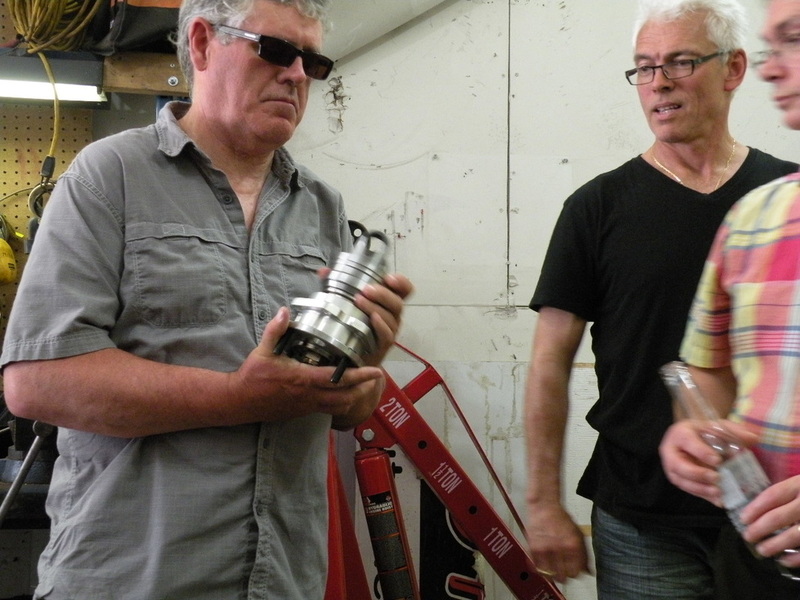 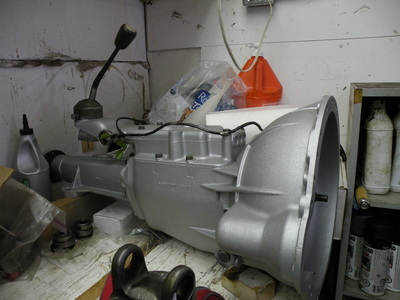 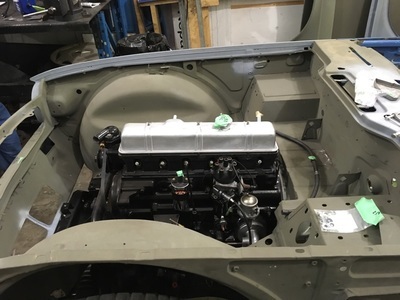 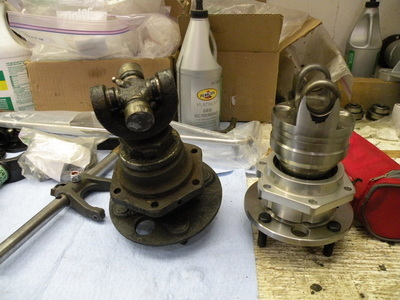 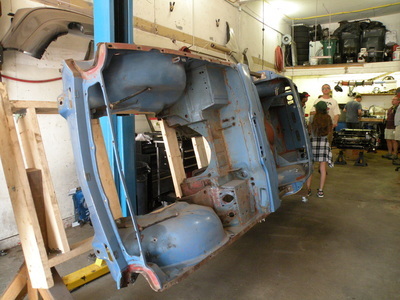 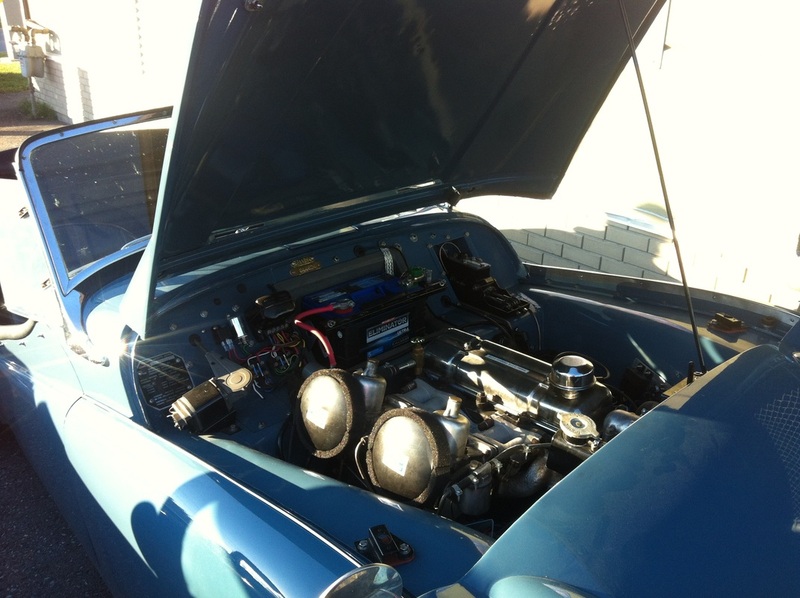 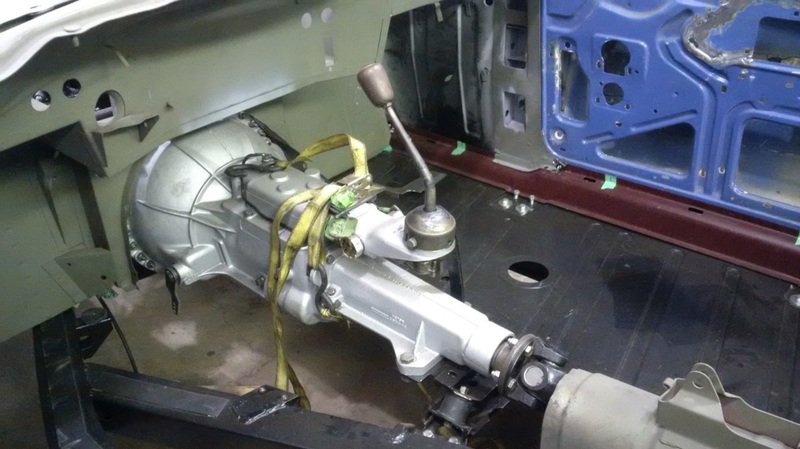 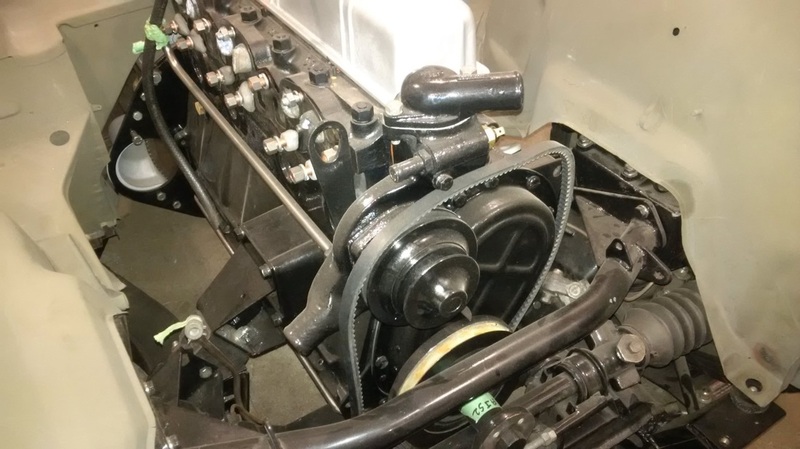 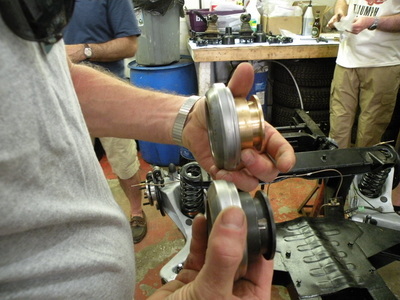 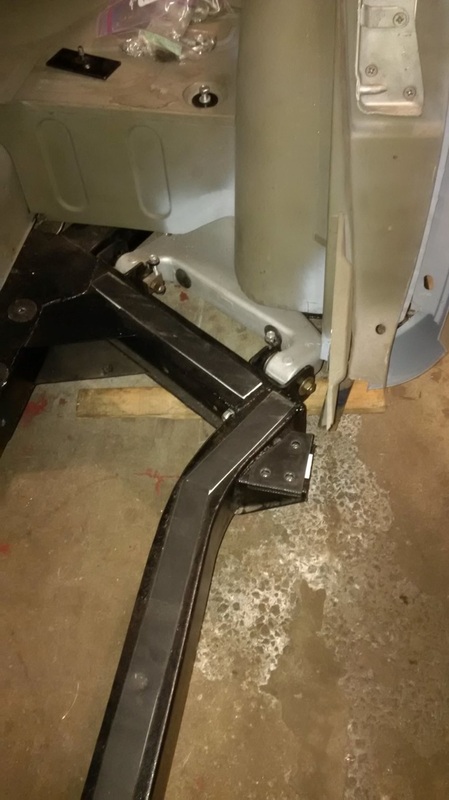 Thanks to Chuck for arranging a garage visit on 28 May both show the great work he is doing on my TR6 restoration and to introduce club members to a couple of local mechanics - Mat Johnson of Johnson Automotive and Rahael Solomon, who has worked on British Cars for 30 years. 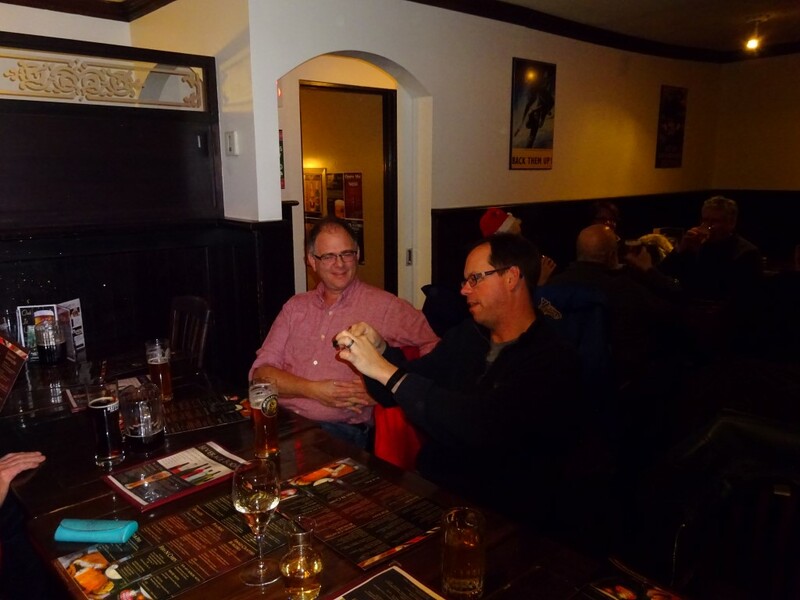 Thanks to Roly for the pictures. 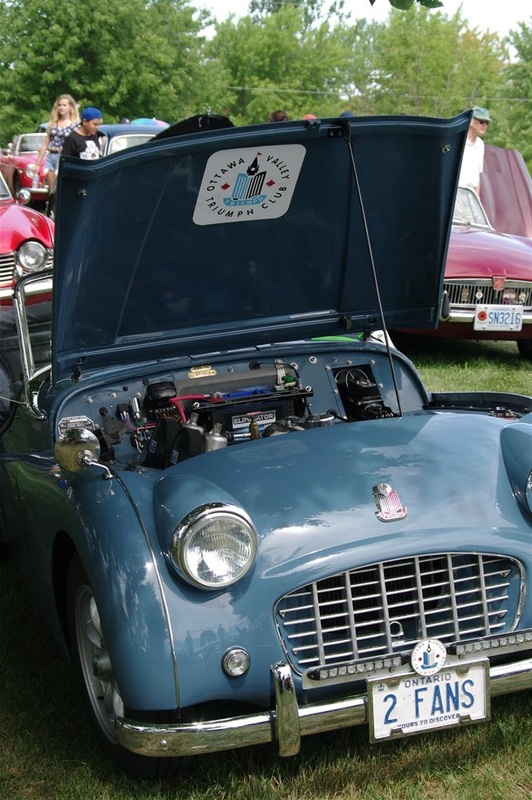 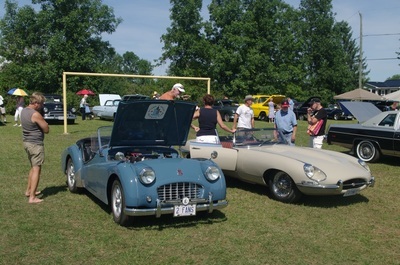 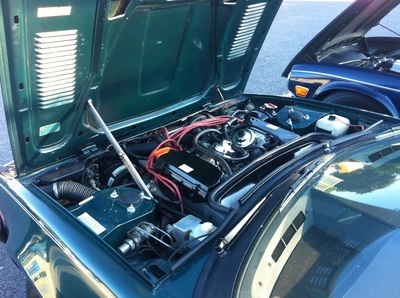 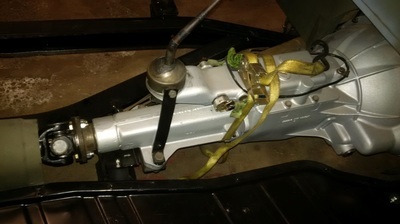 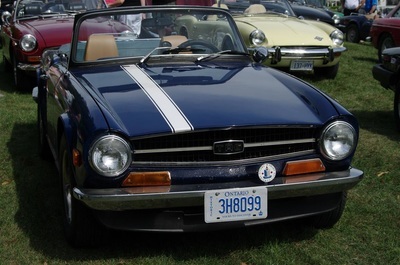 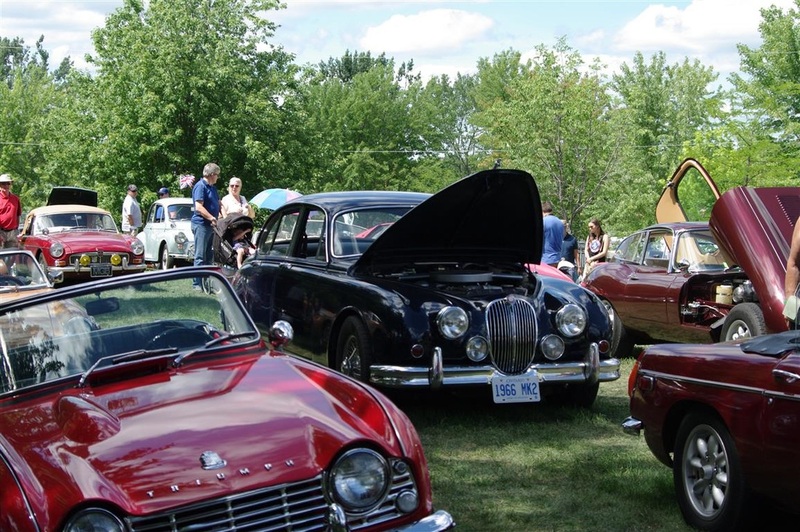 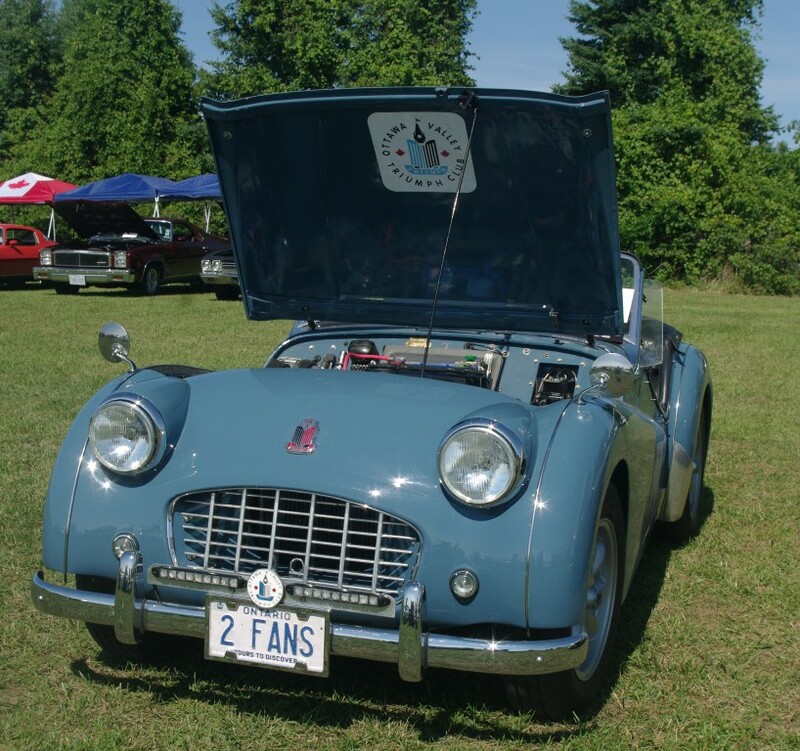 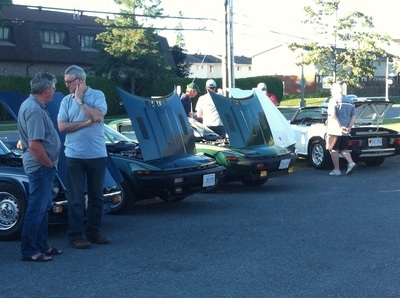 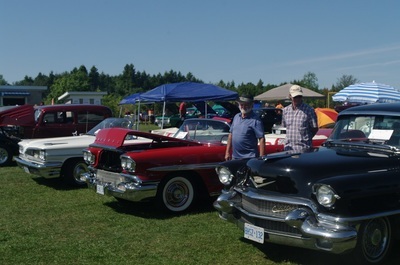 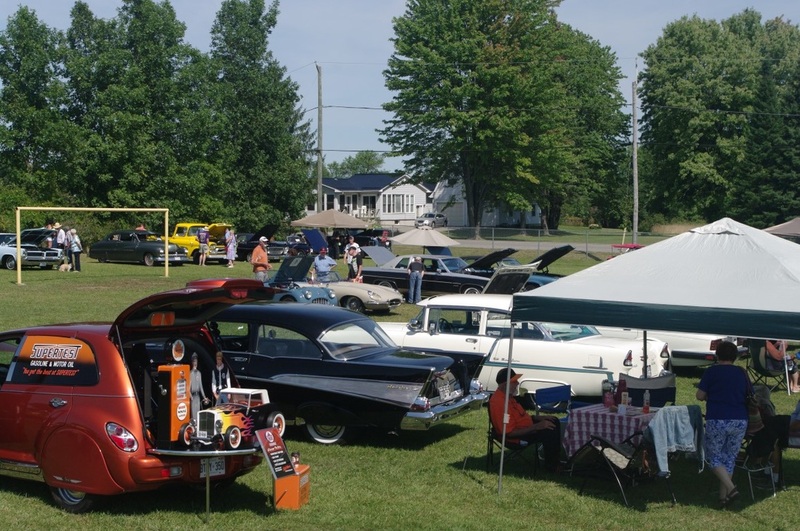 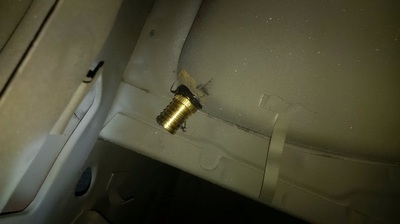 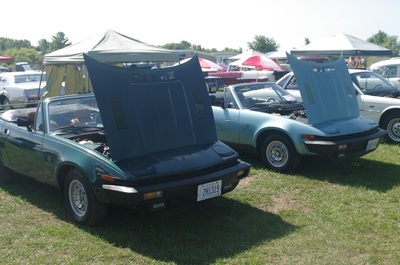 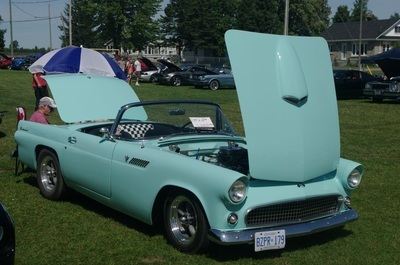 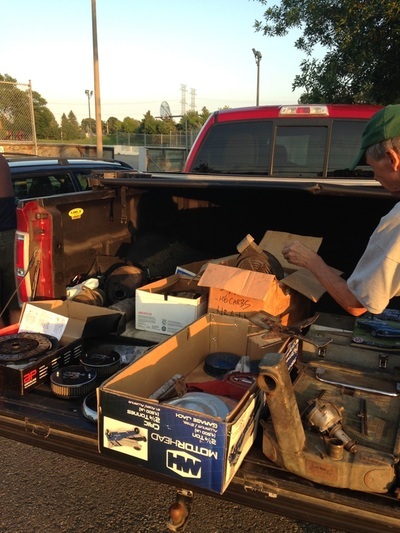 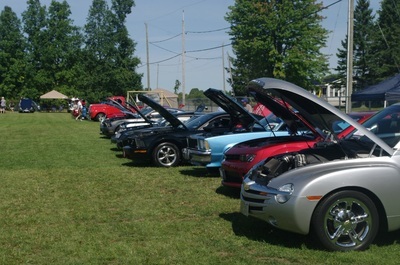 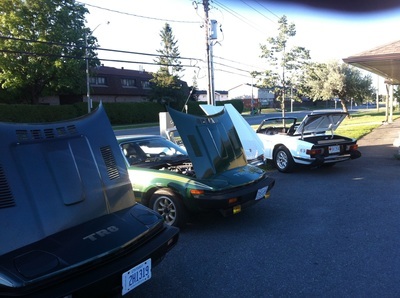 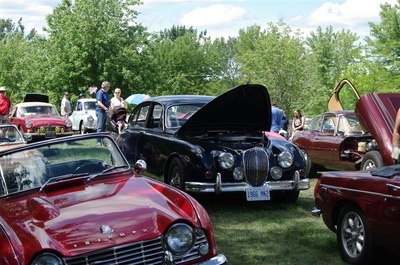 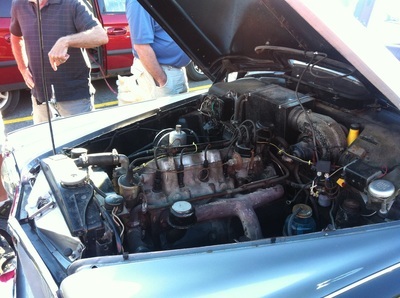 First Annual OVTC - OMGC Drive, 25 June. 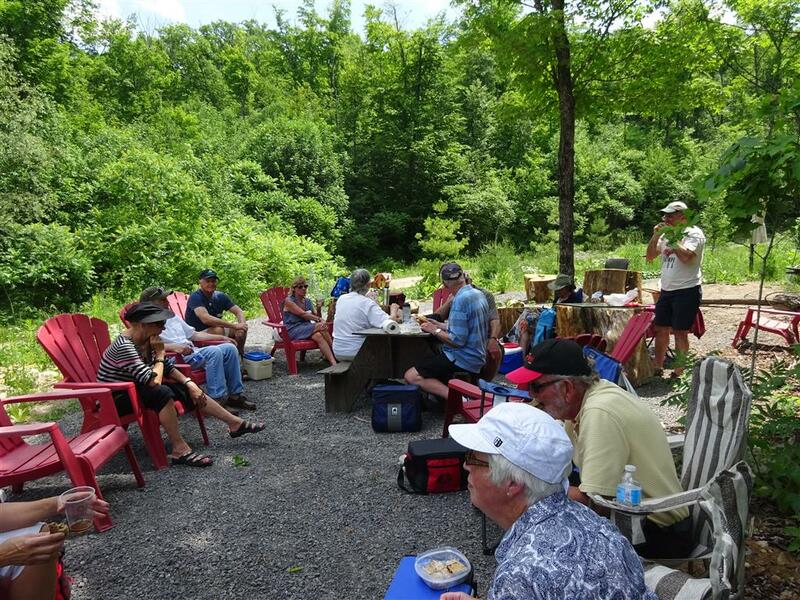 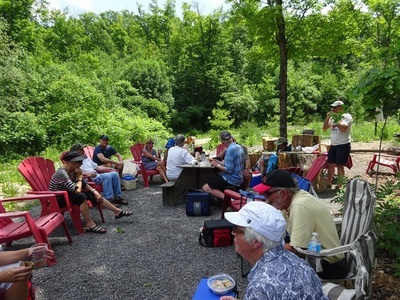 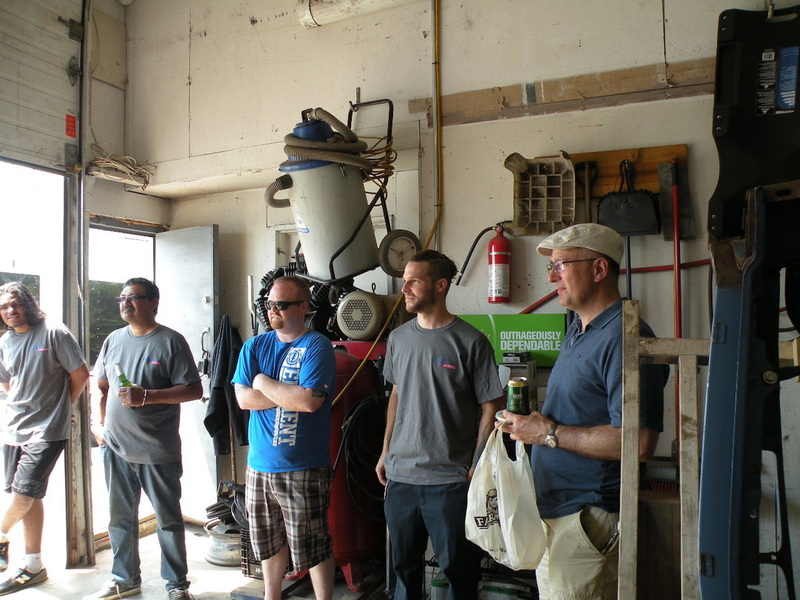 Destination was Cartwright Springs Brewery for a tour and barbecue picnic. 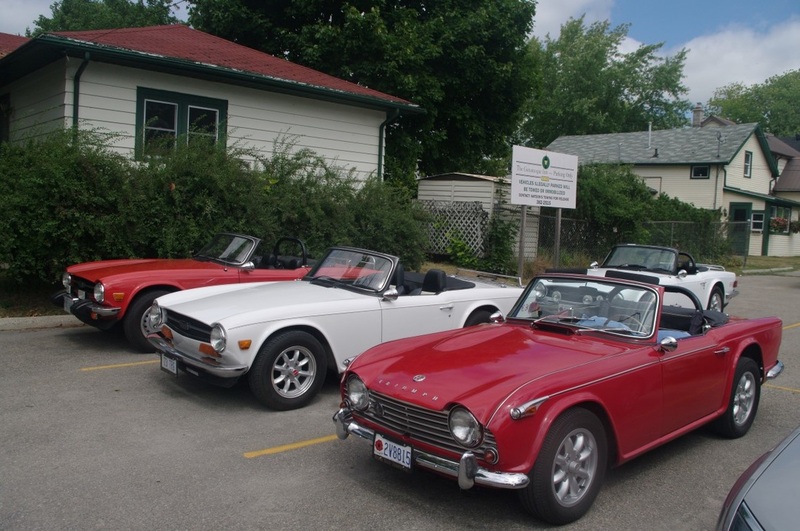 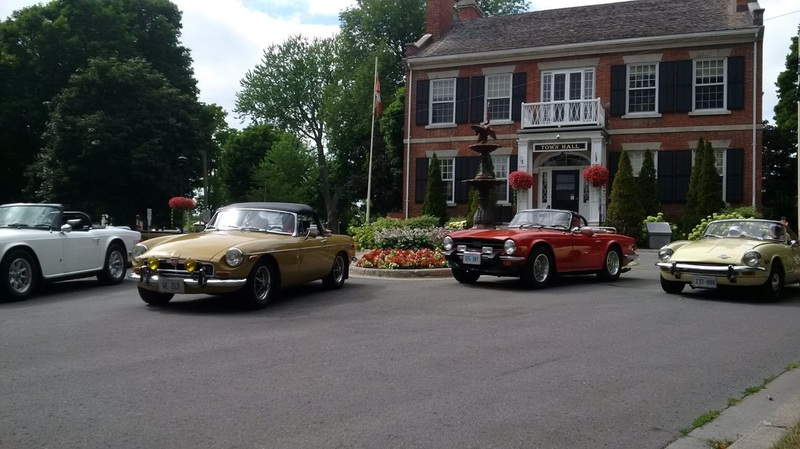 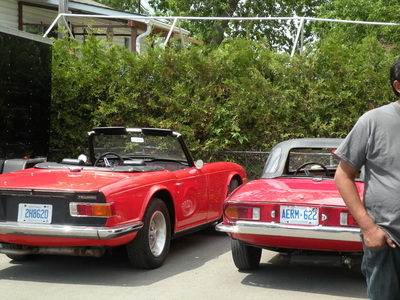 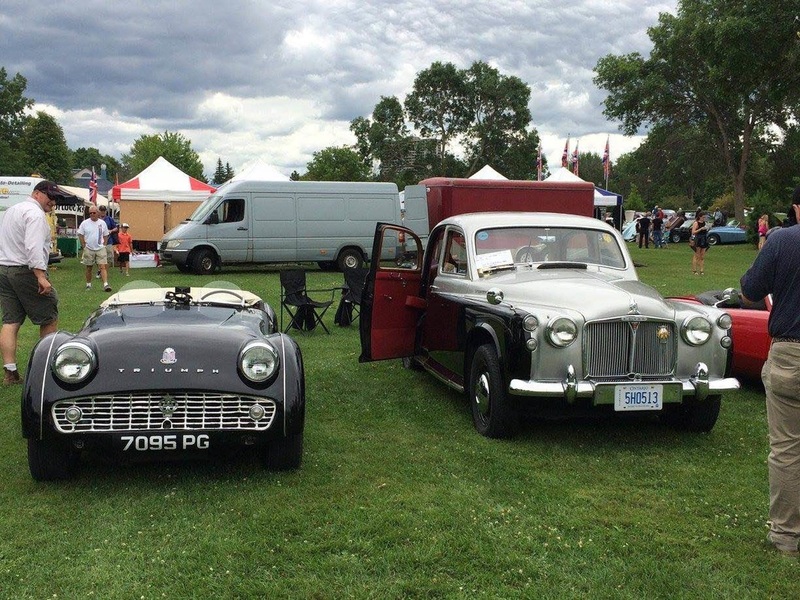 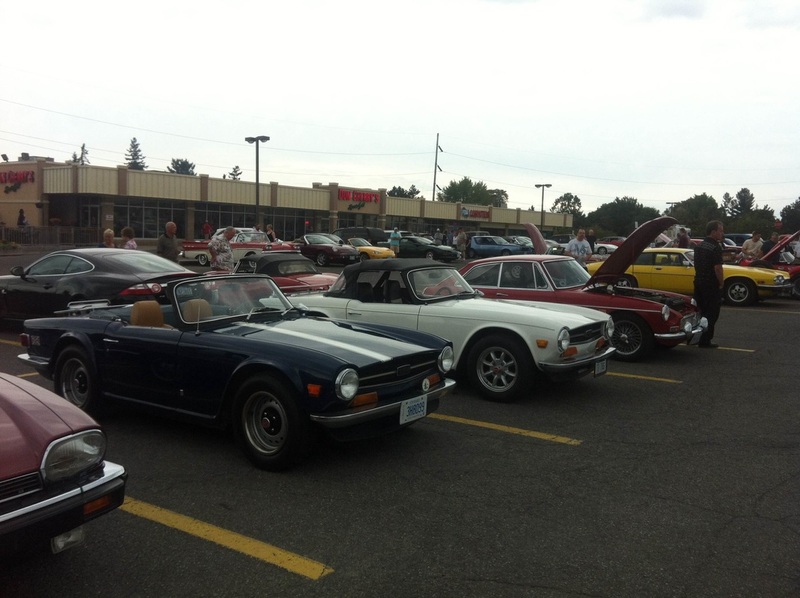 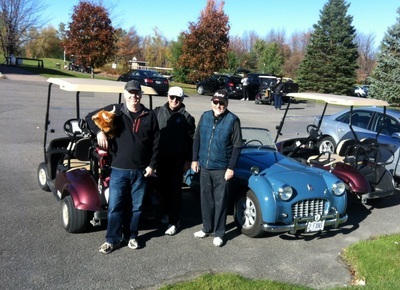 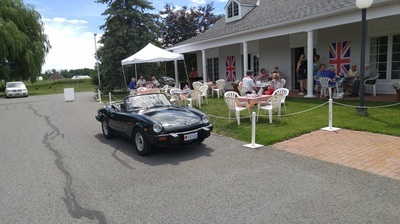 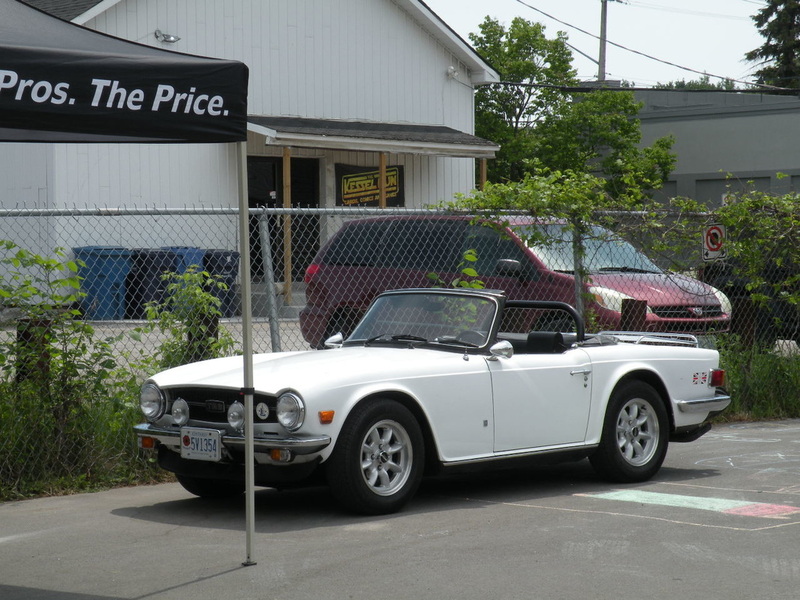 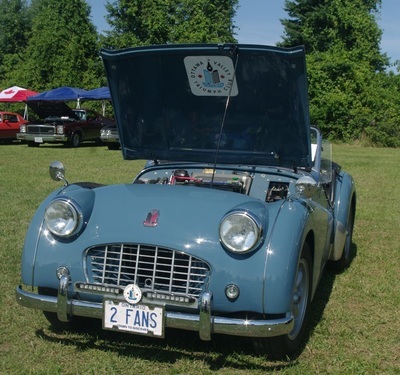 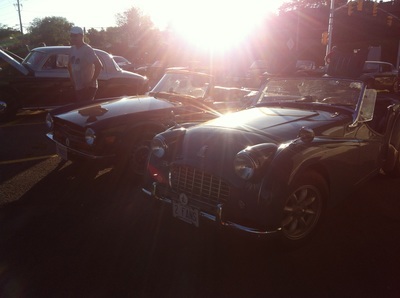 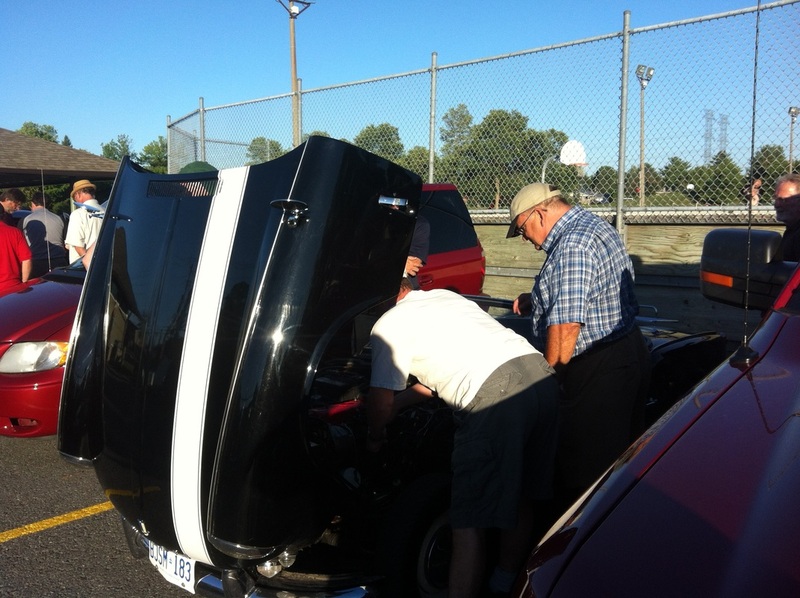 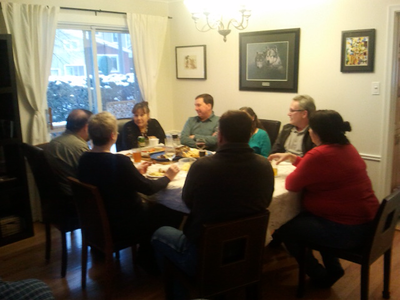 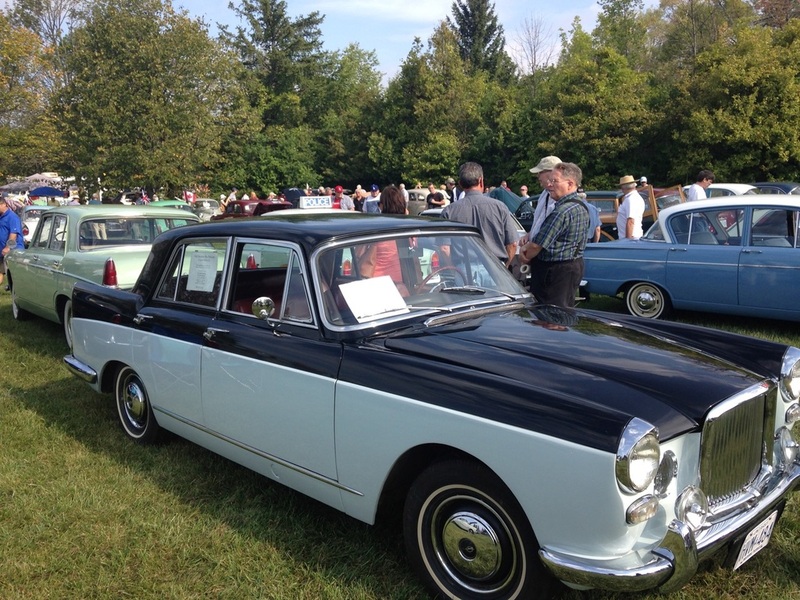 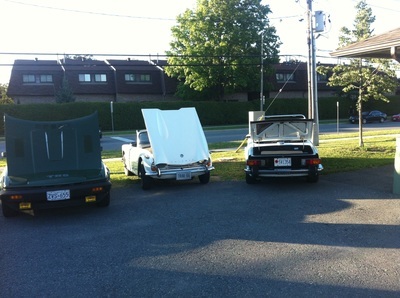 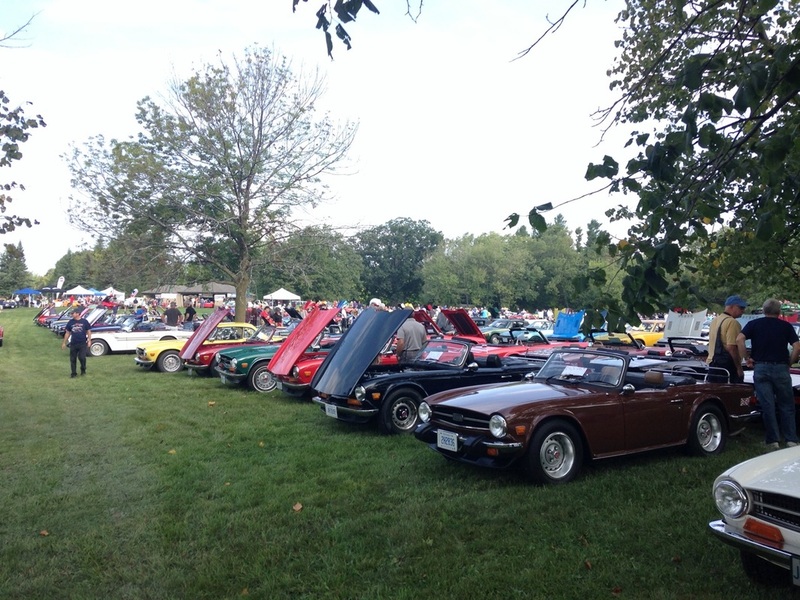 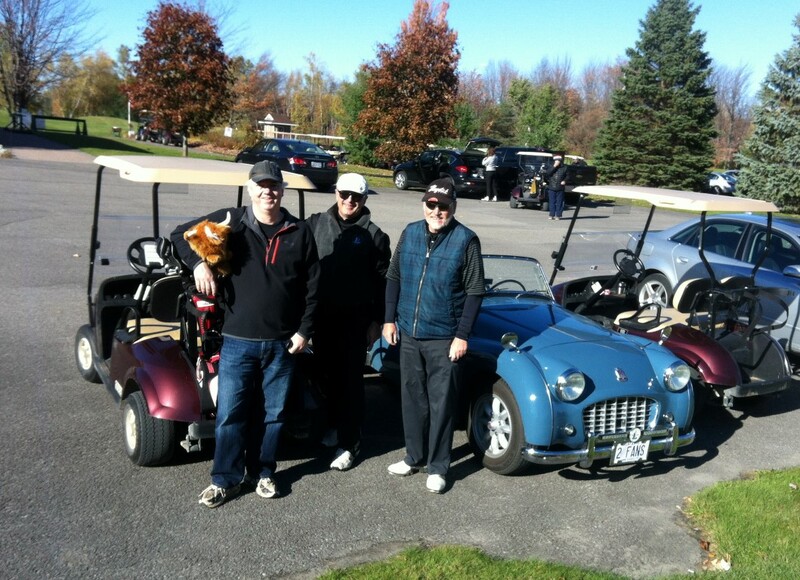 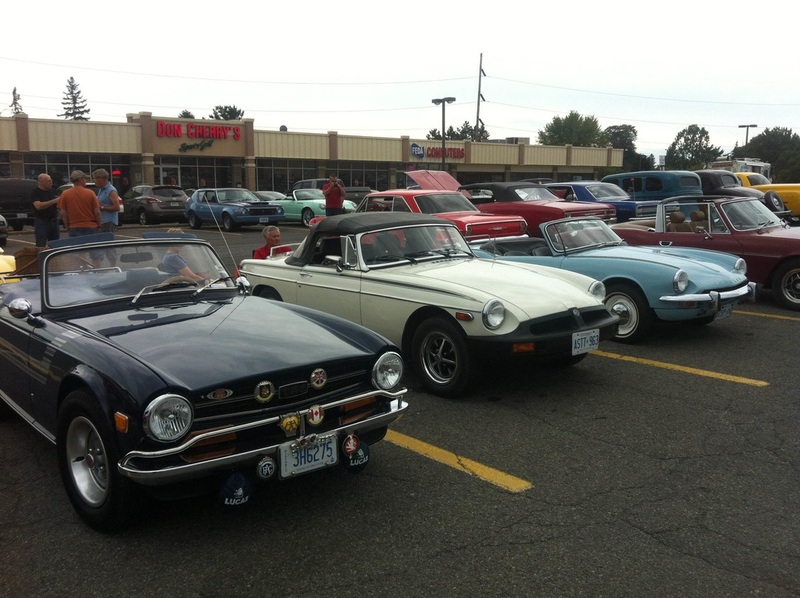 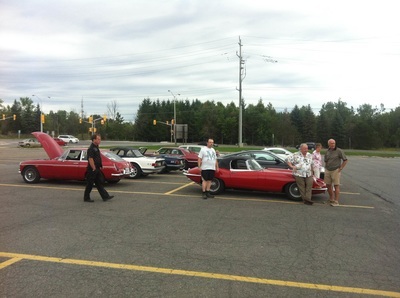 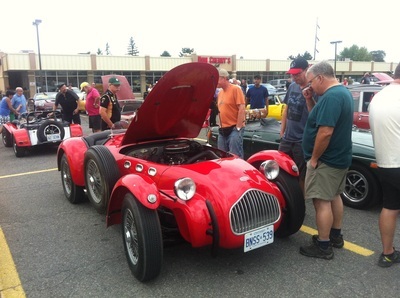 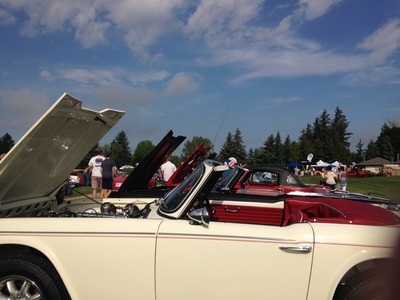 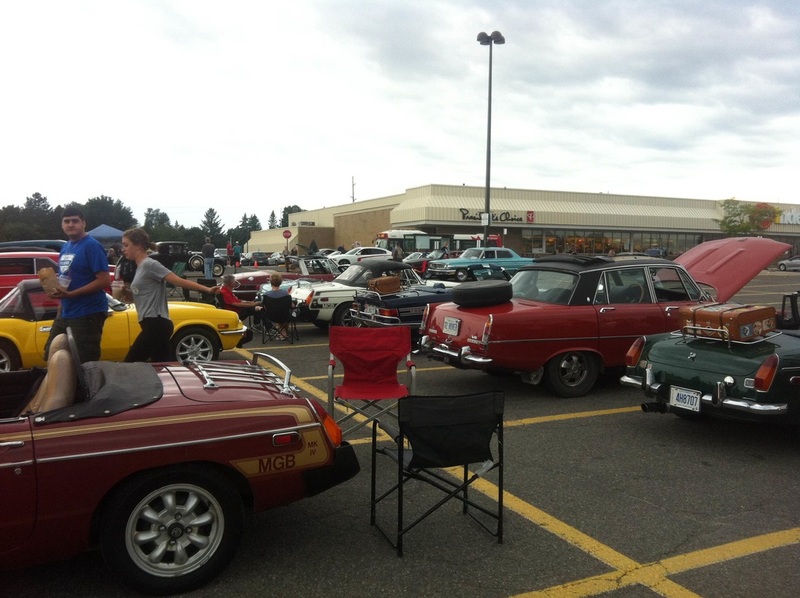 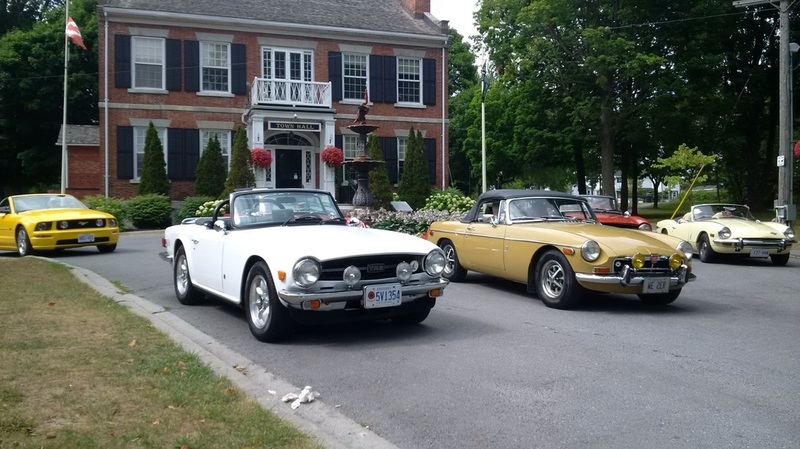 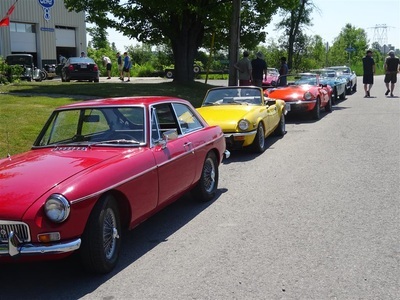 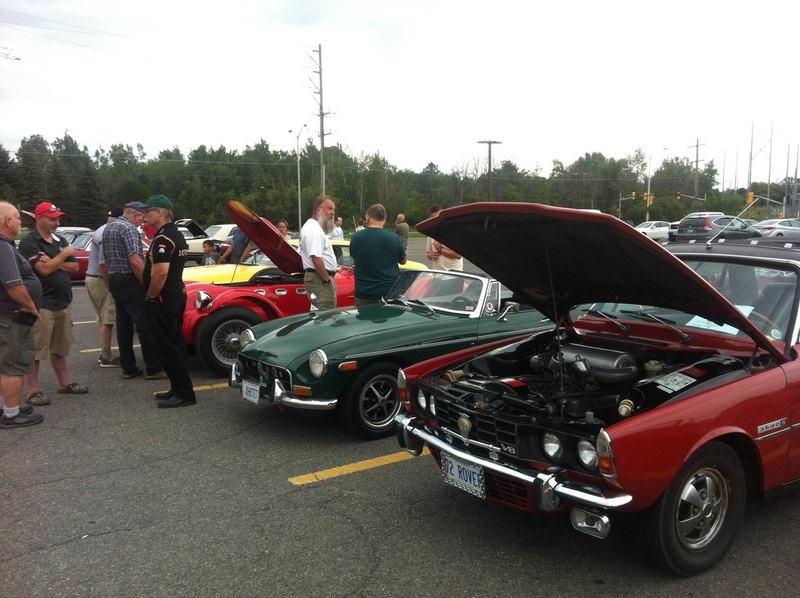 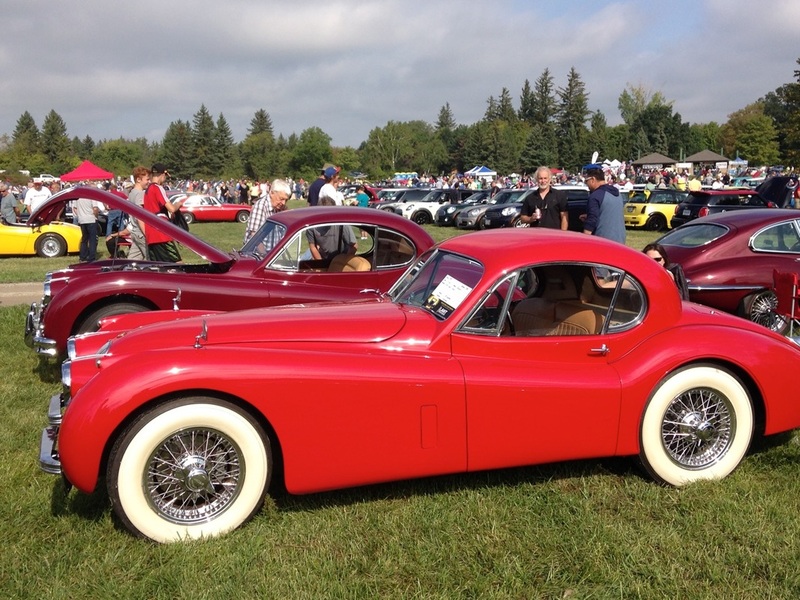 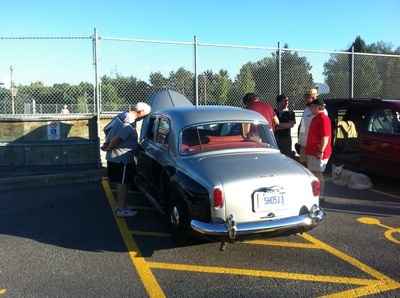 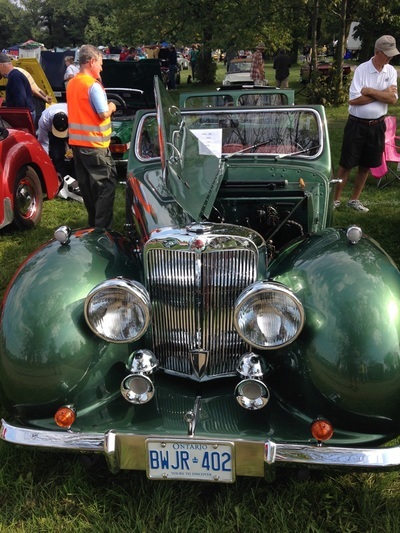 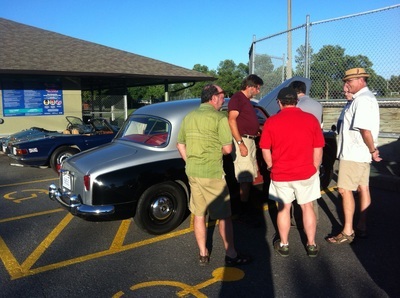 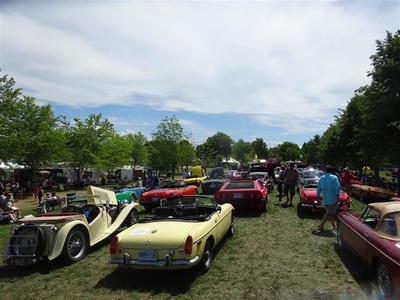 Great to get together with our friends in the Ottawa MG Club. 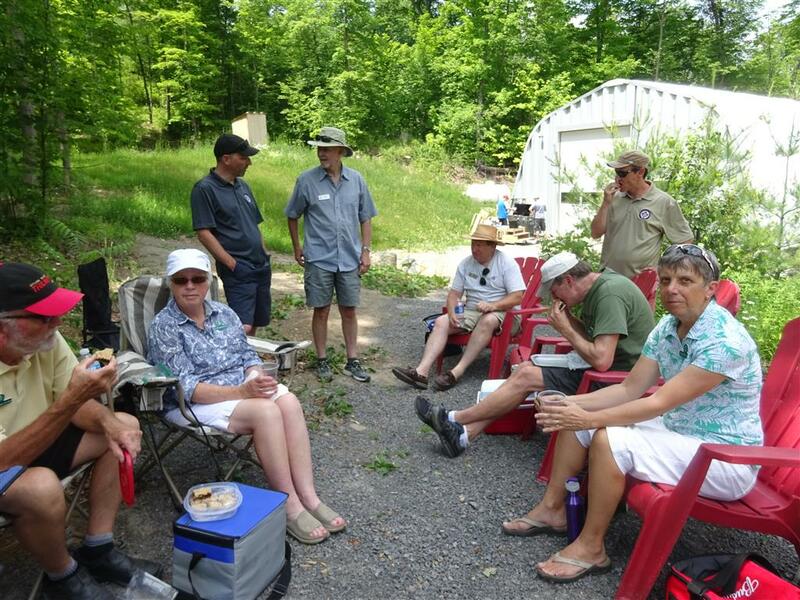 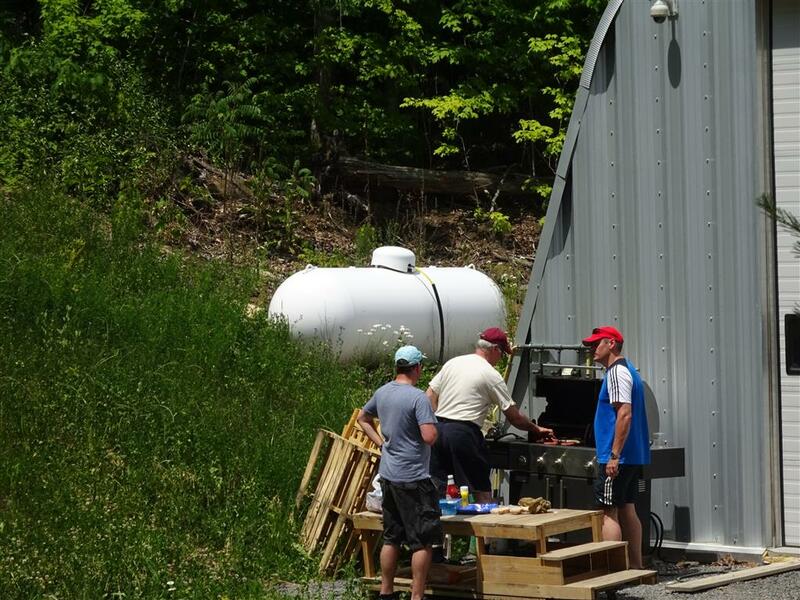 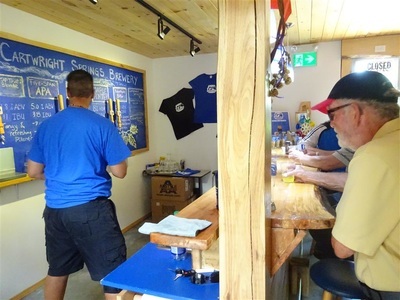 Thanks to Andre of Cartwright Brewery for explaining the different beers they produce, providing samples, and making the BBQ available for our use. 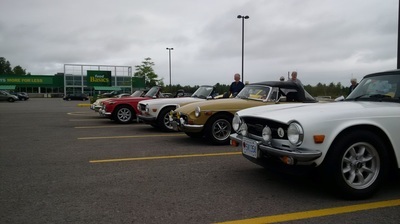 ABCD was another huge success this year and went off without a hitch. 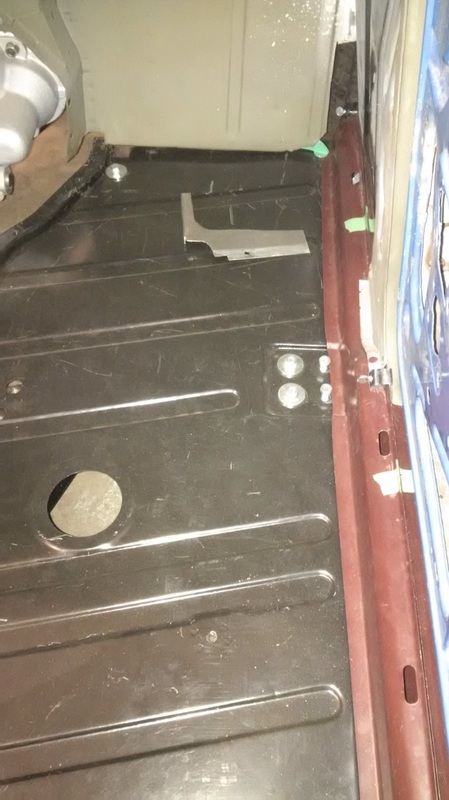 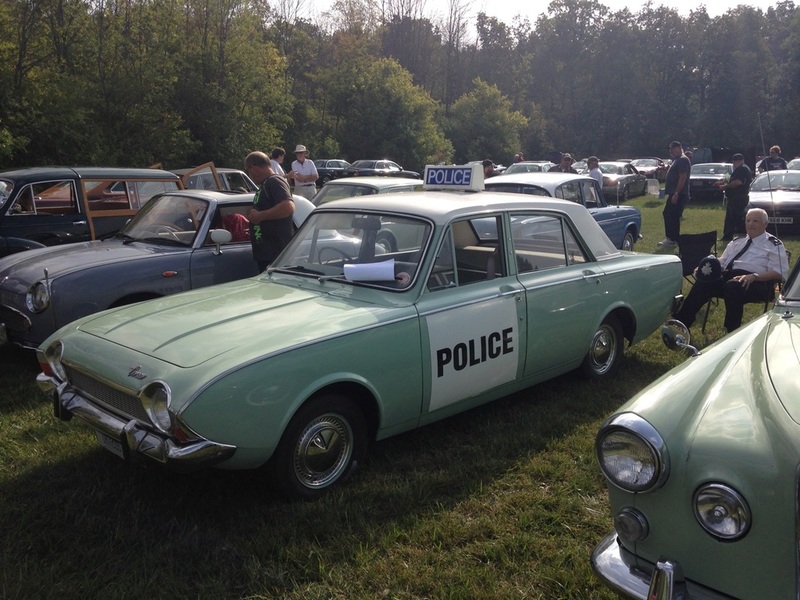 There were 196 cars in attendance. 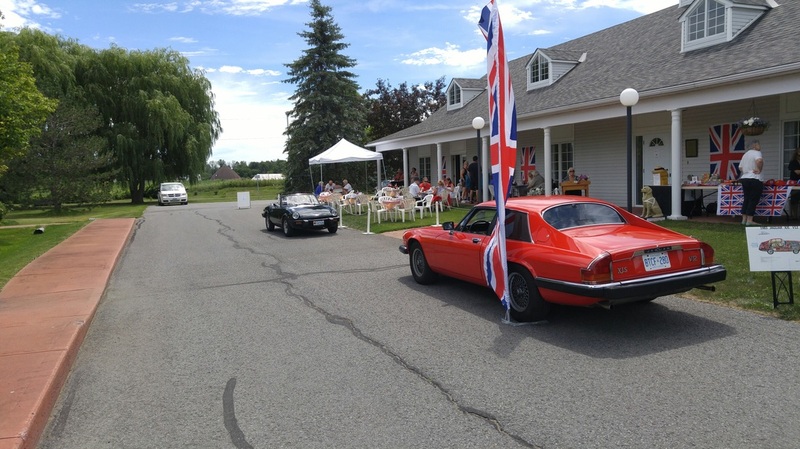 Lotus was the featured marque this year to mark 50 years of the Lotus Europa and 40 years of the Lotus Esprit. 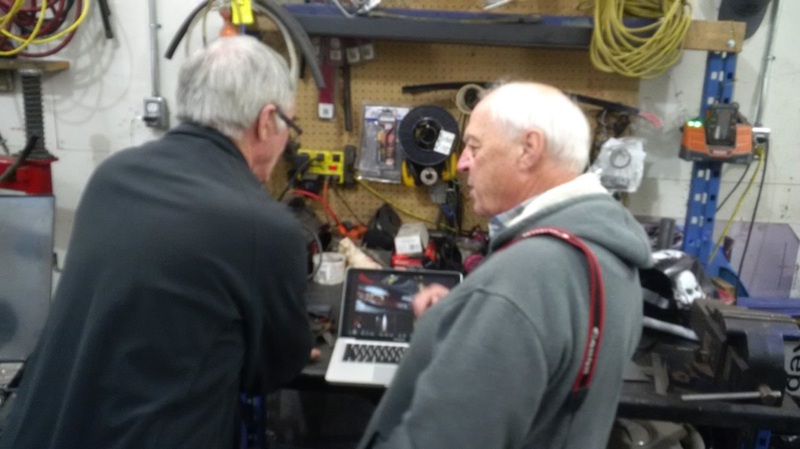 Thanks to Rick Cooper for creating and sharing a great video of ABCD. 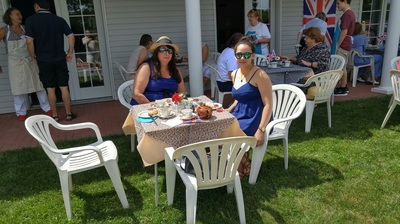 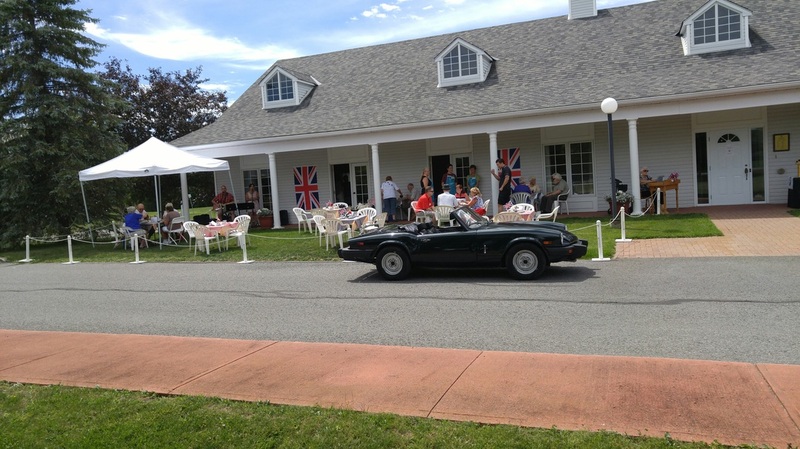 A garden party and tea in the tradition of British High Tea held on Sunday, 24 July. 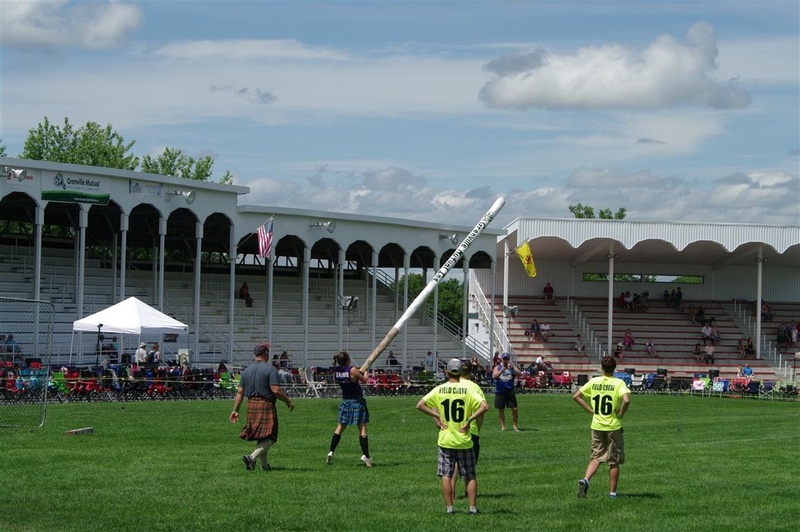 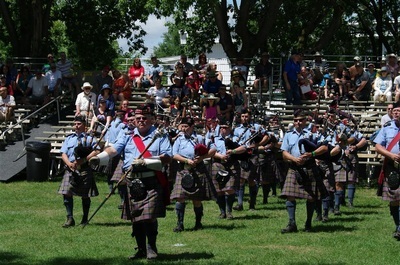 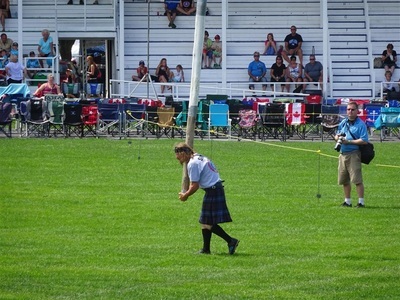 The event took place at the National Training Centre of Canadian Guide Dogs for the Blind. 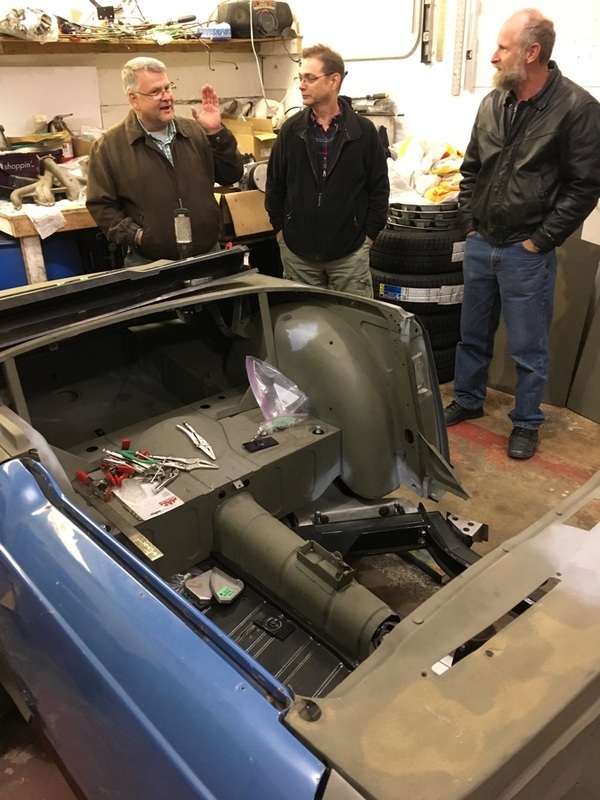 Great turnout of cars at meeting along with an interesting presentation on evolution of doors from TR4 through late TR6 by Chuck Hobbs and some impromptu carb tuning. 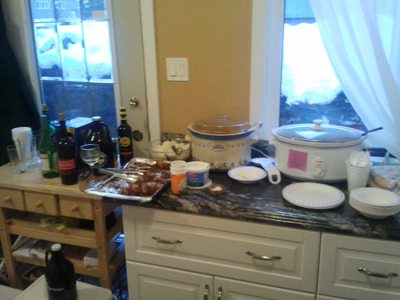 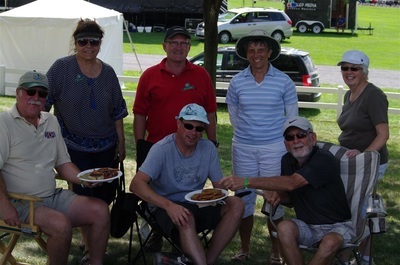 A great event, with good food, lots of ongoing events, and good friends. 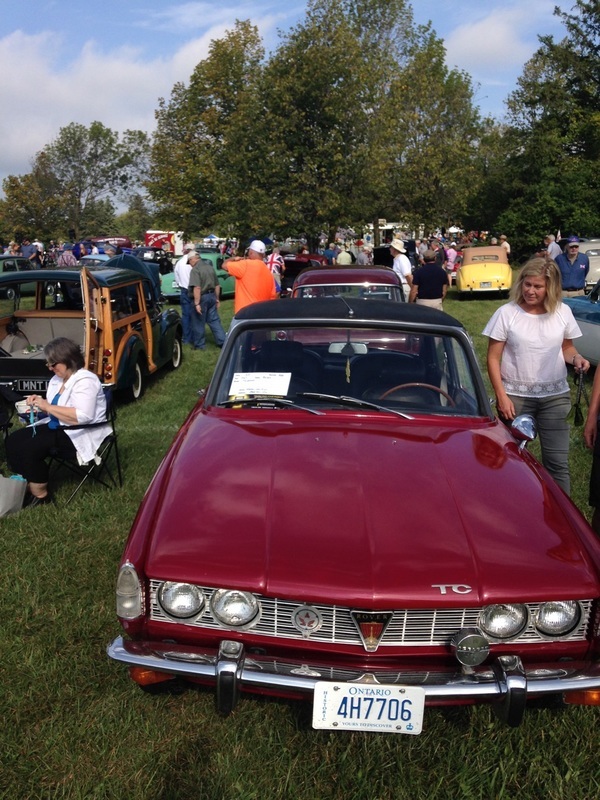 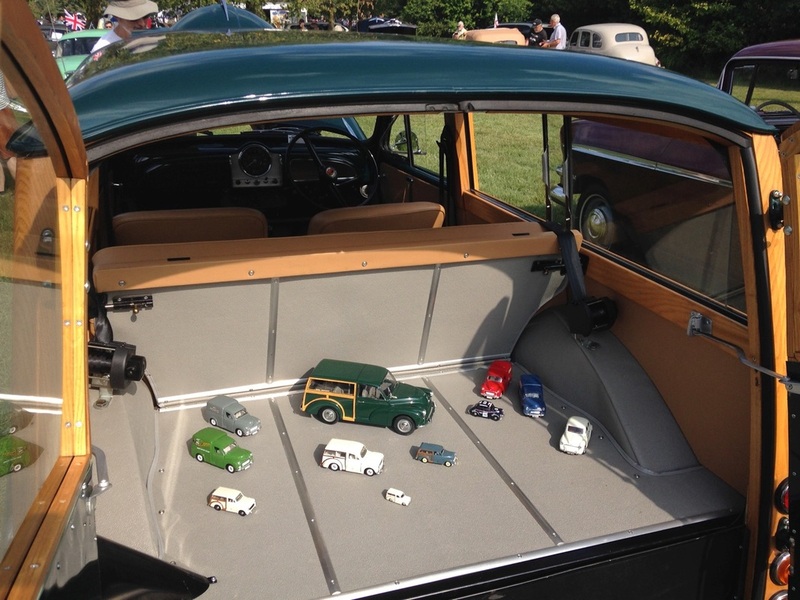 Many folk very interested in the British Car Display, which included about 60 cars. 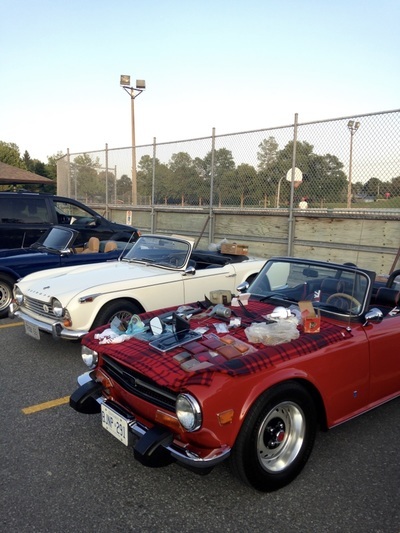 Thanks to Will Robertson for organizing the display. 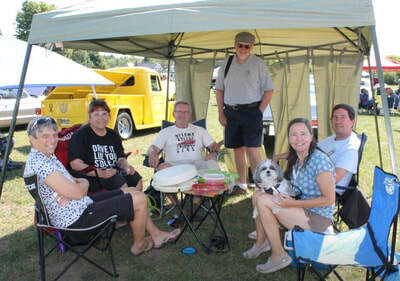 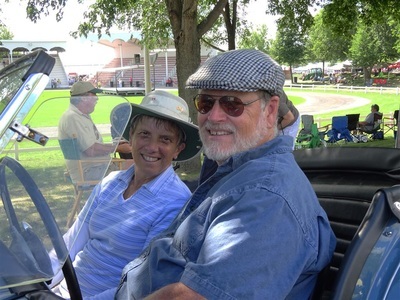 Five OVTC members drove cars down in a convoy - Dave and Elaine, Bob and Fran, Paul, Phil, and Mike and Marjorie. Thanks to Dave and Elaine for organizing a great run. 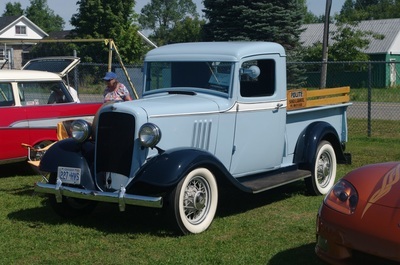 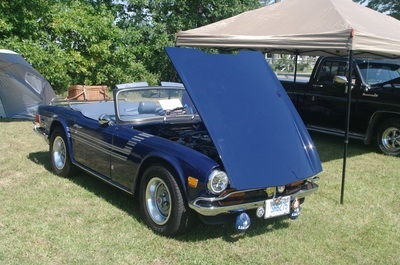 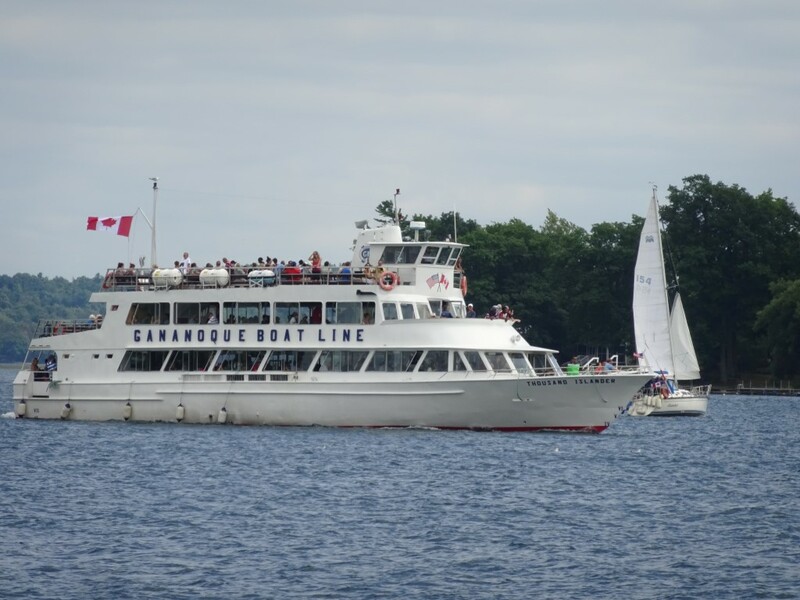 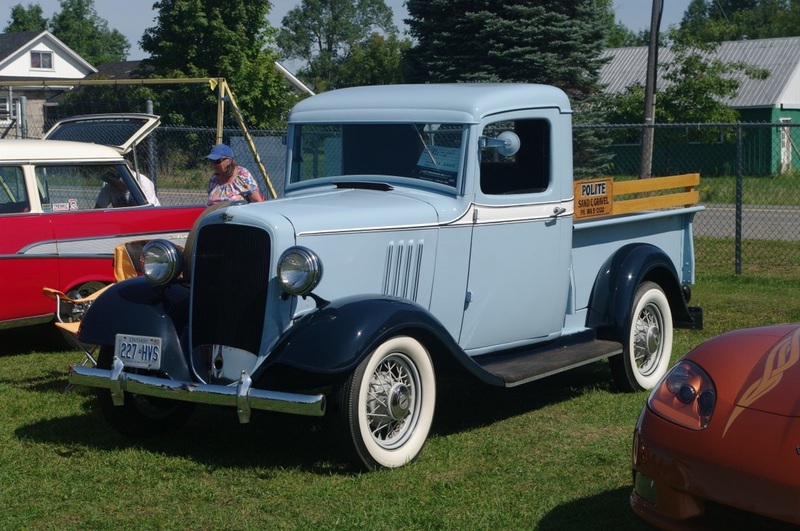 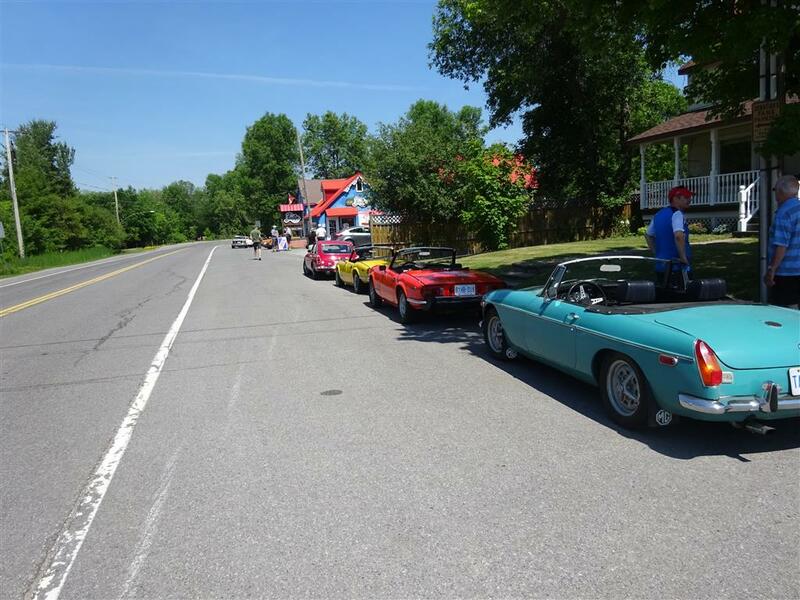 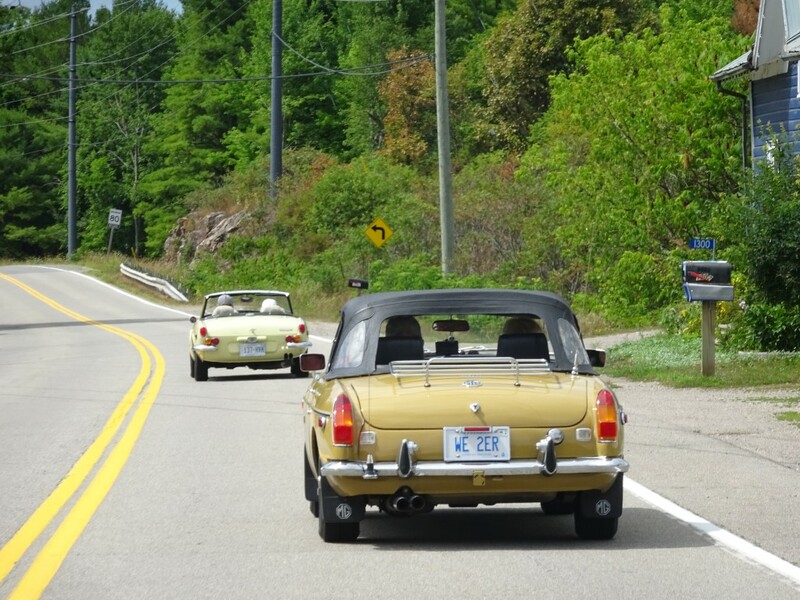 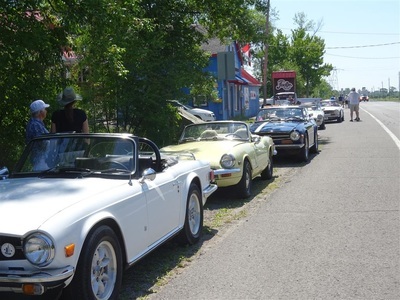 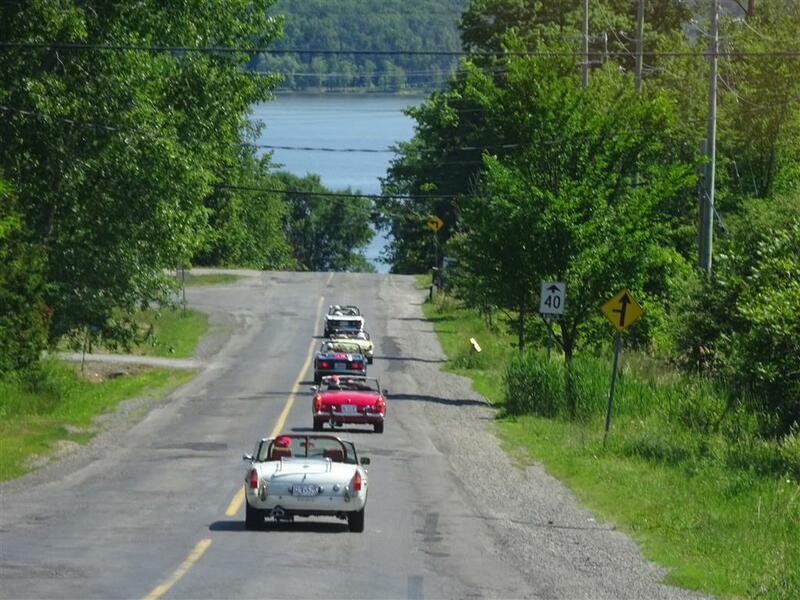 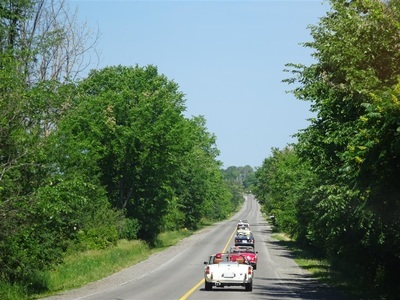 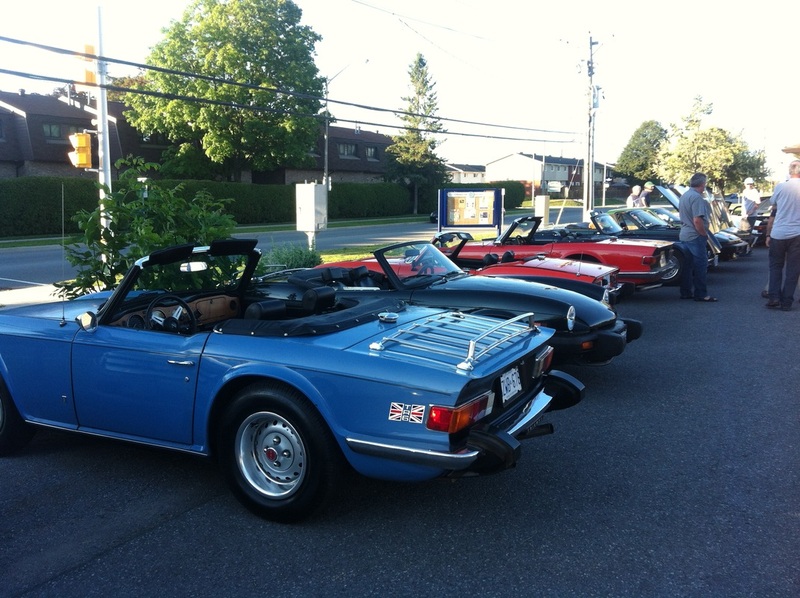 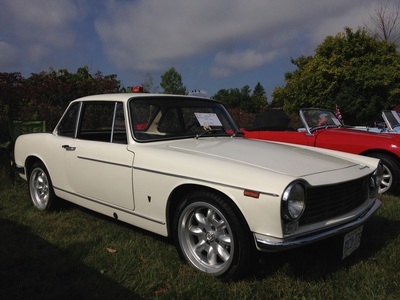 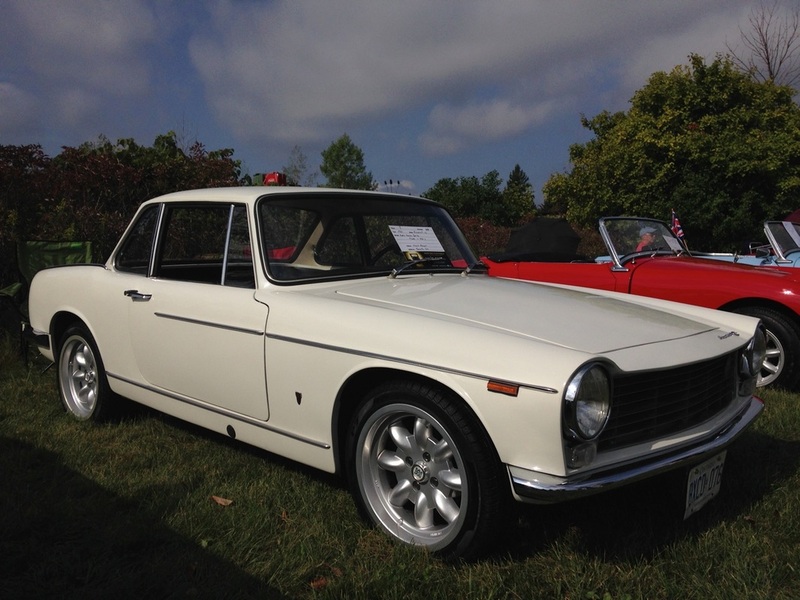 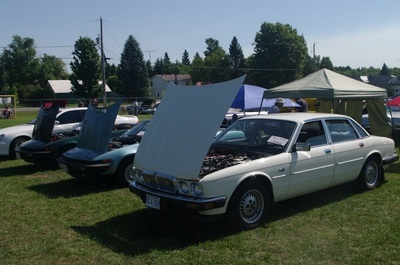 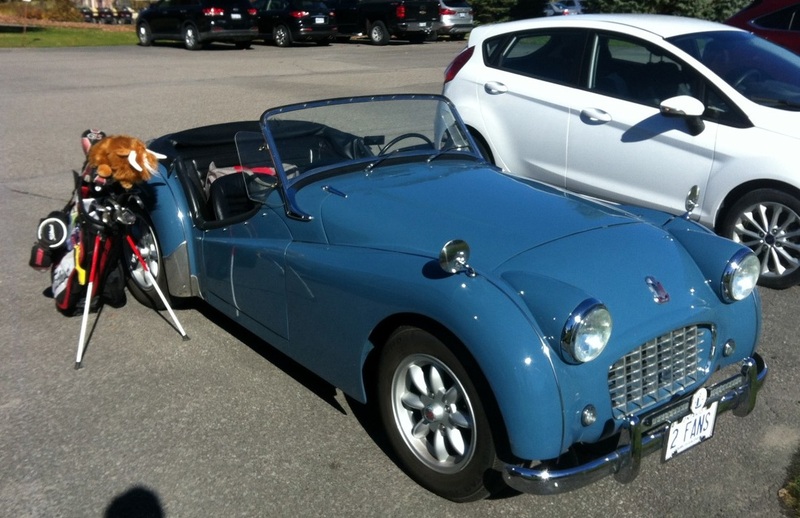 Both the route and the weather were perfect for a drive down to the St. Lawrence on 14 August. 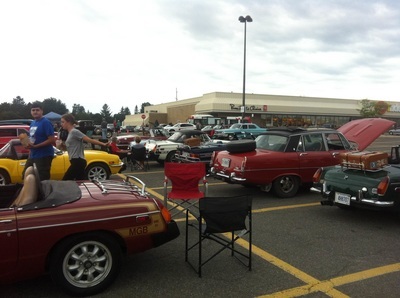 MG enthusiasts Dalton and Chris joined Dave and Elaine, Jeff and Cheryl, Roly and Bev, Paul, Mike S., Phil, and Mike and Marjorie. 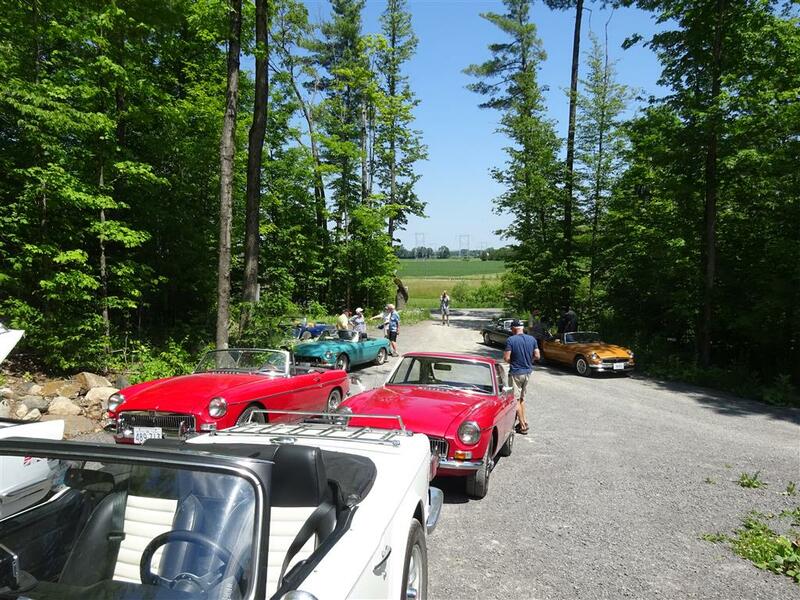 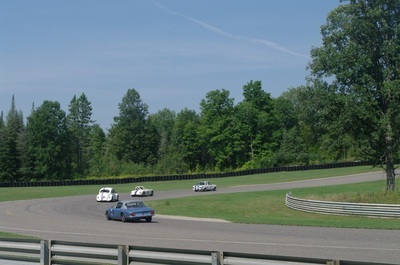 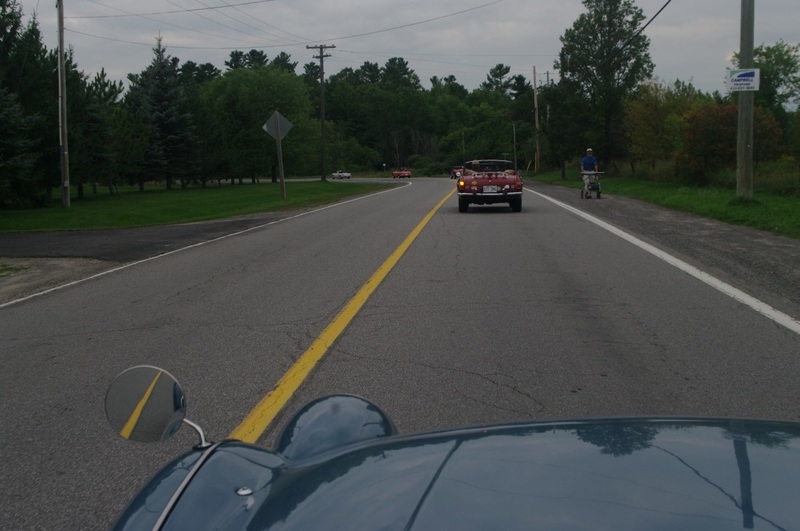 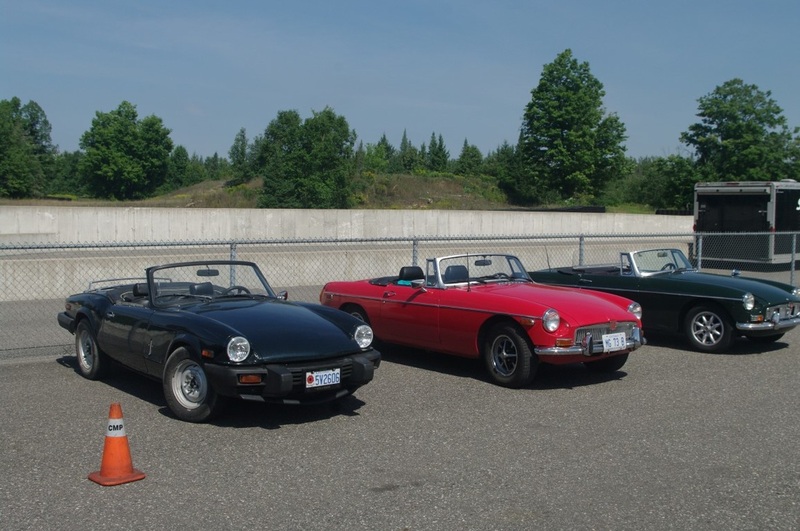 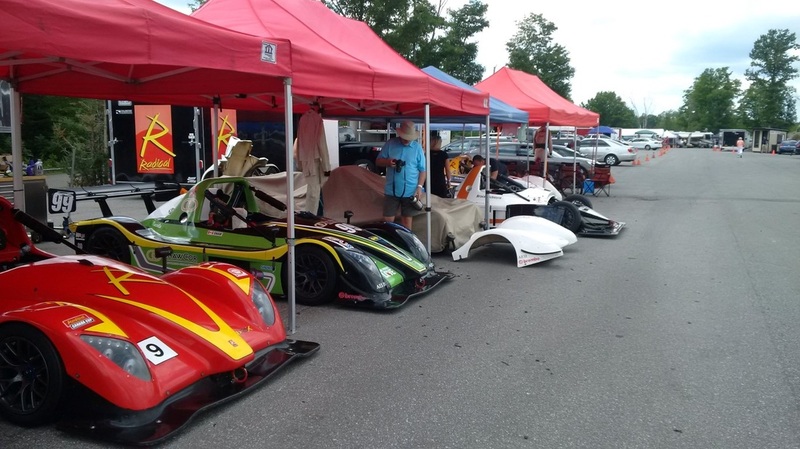 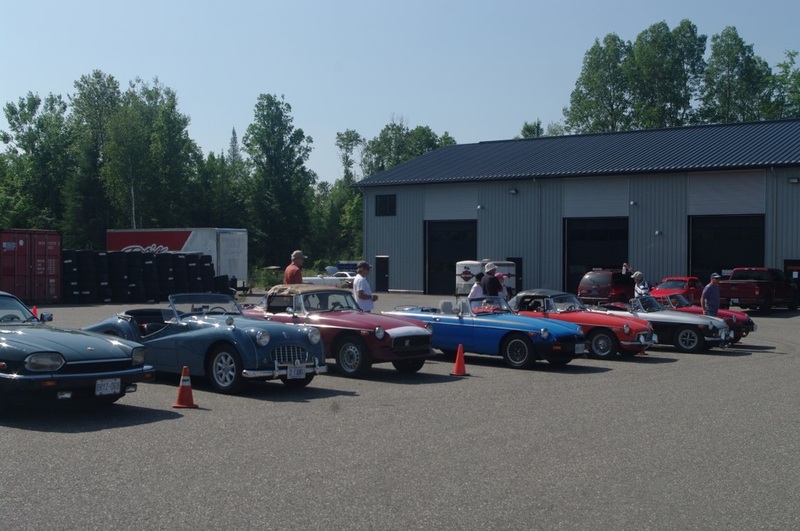 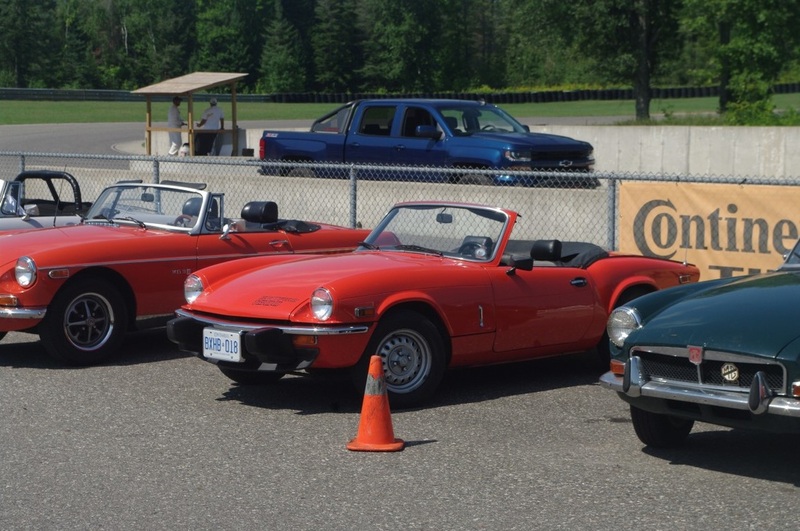 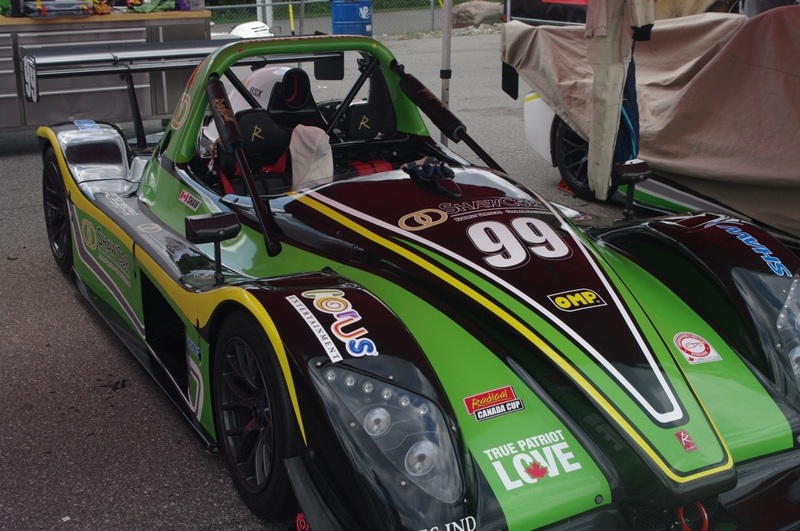 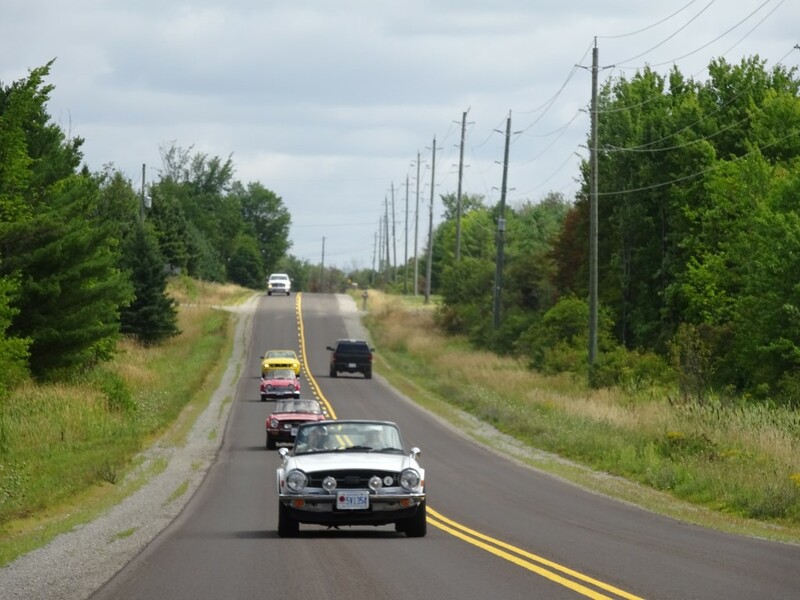 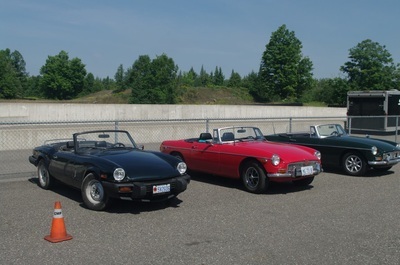 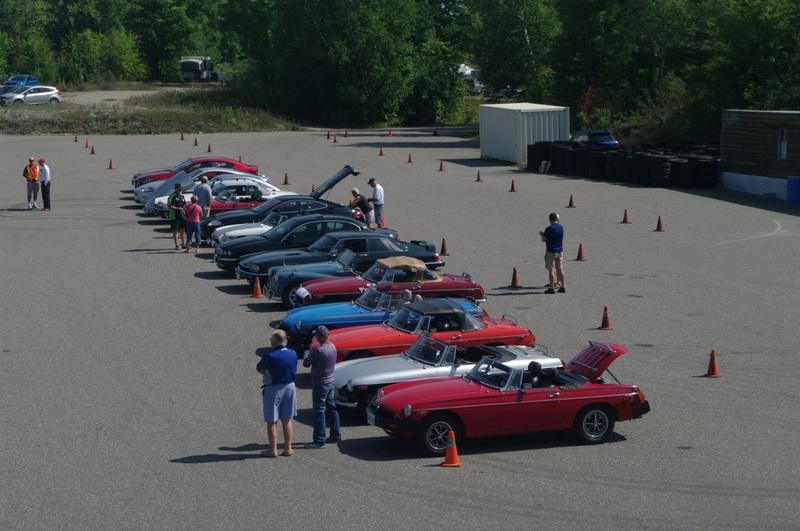 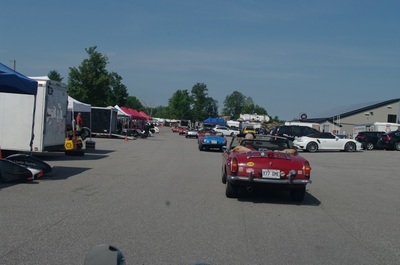 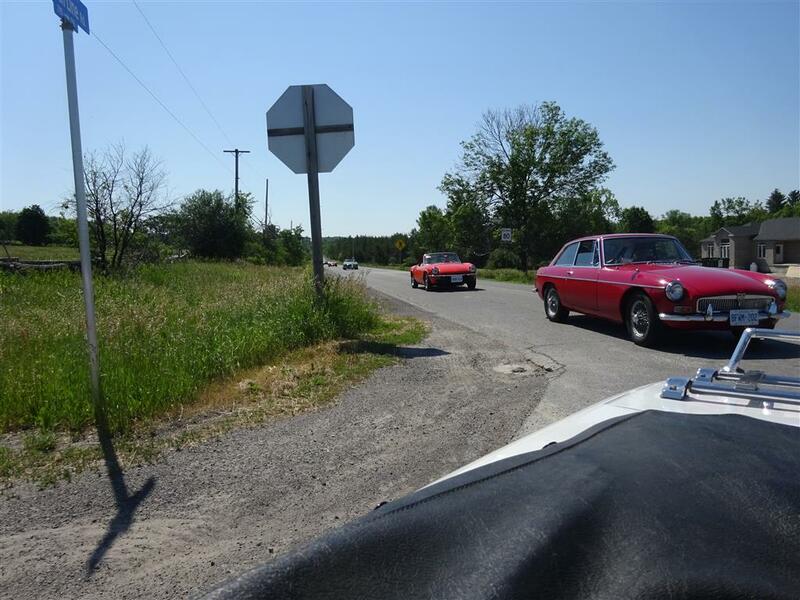 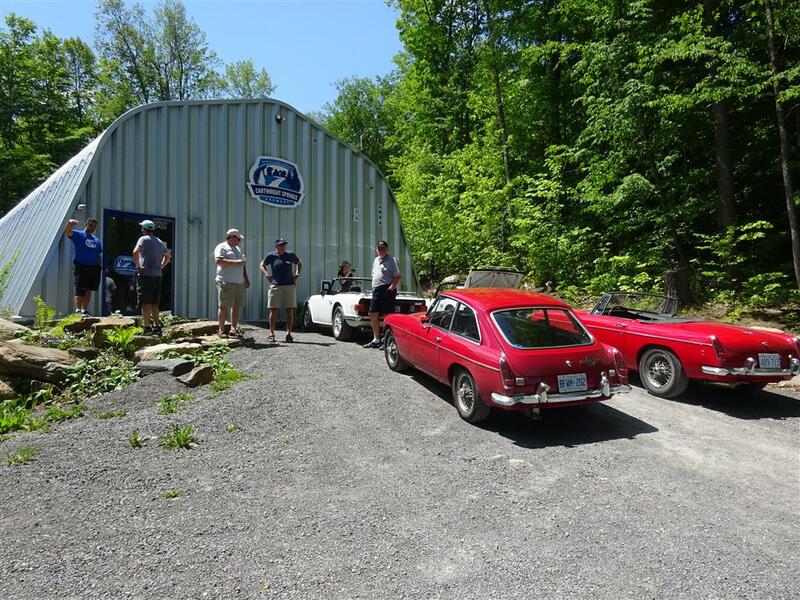 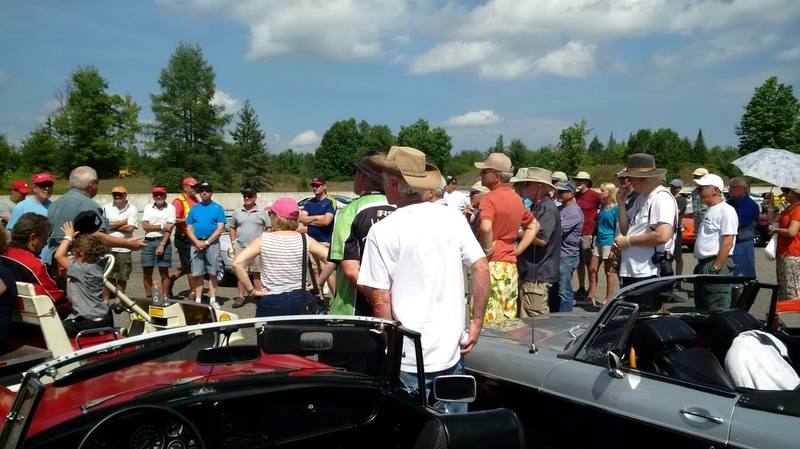 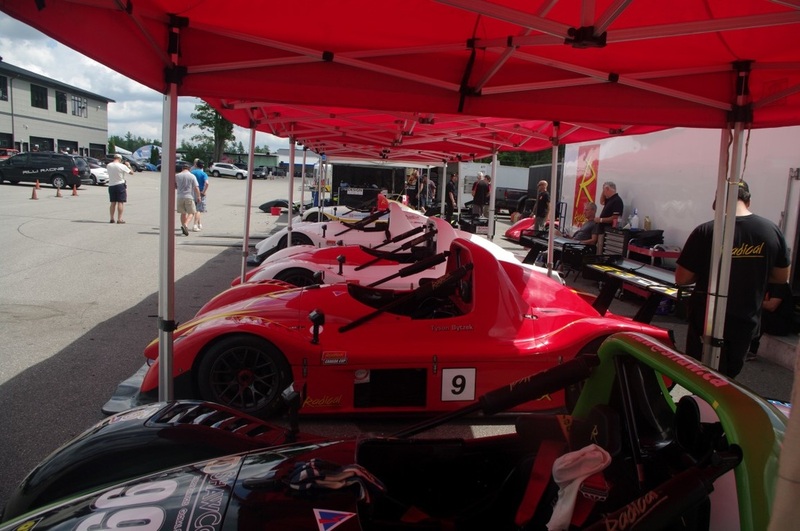 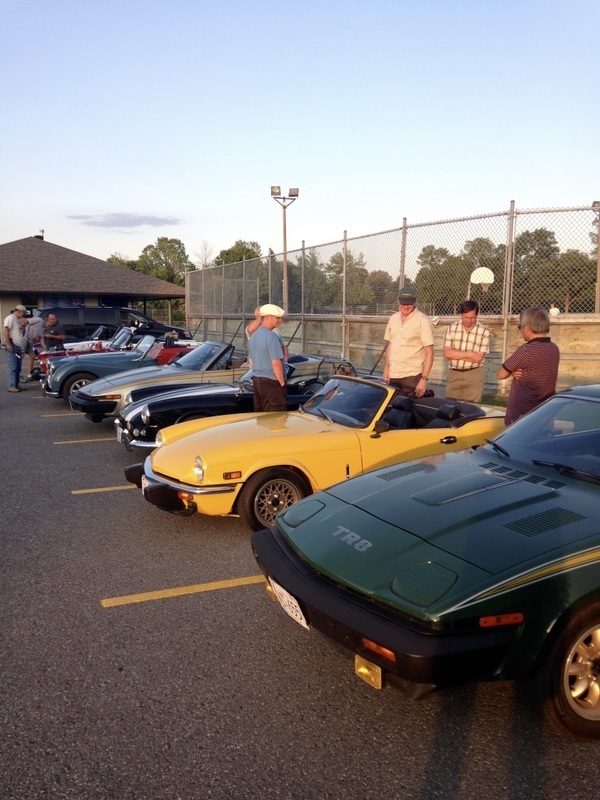 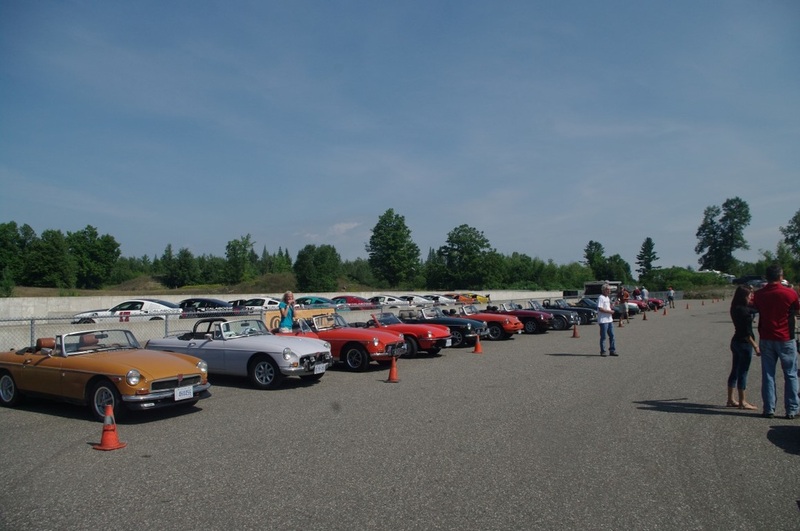 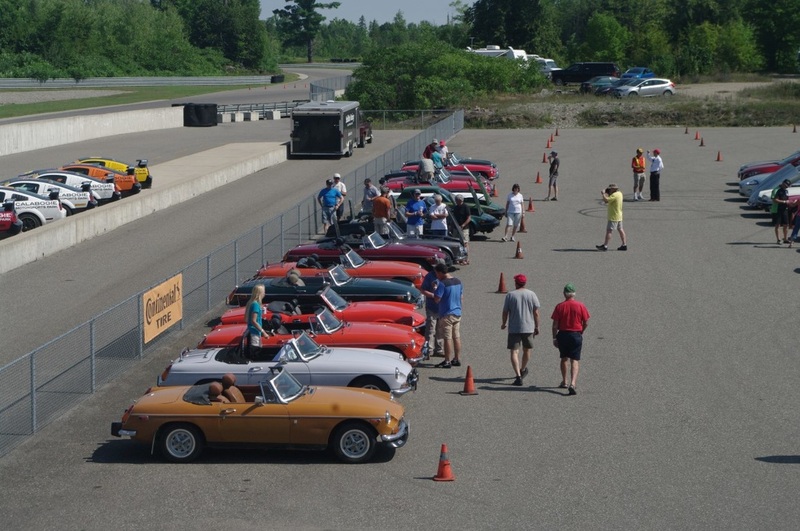 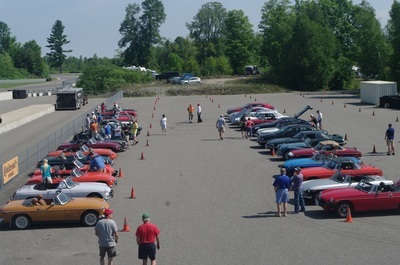 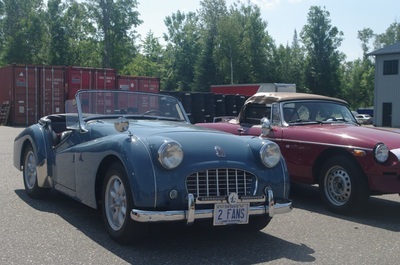 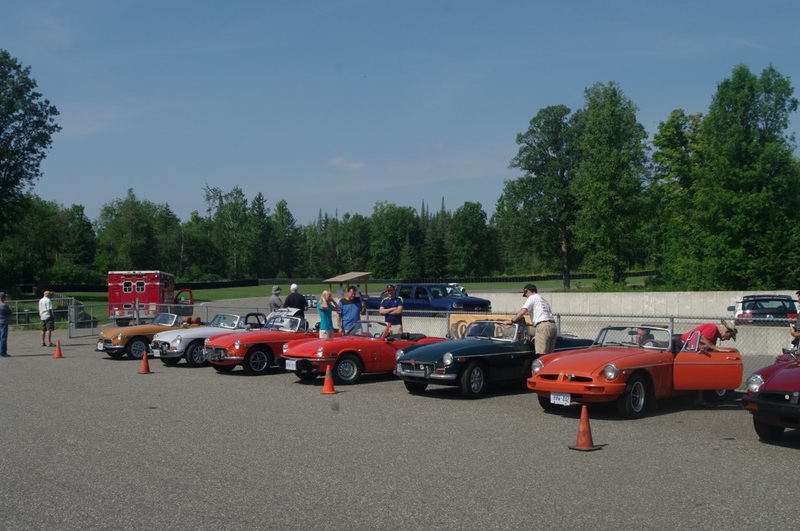 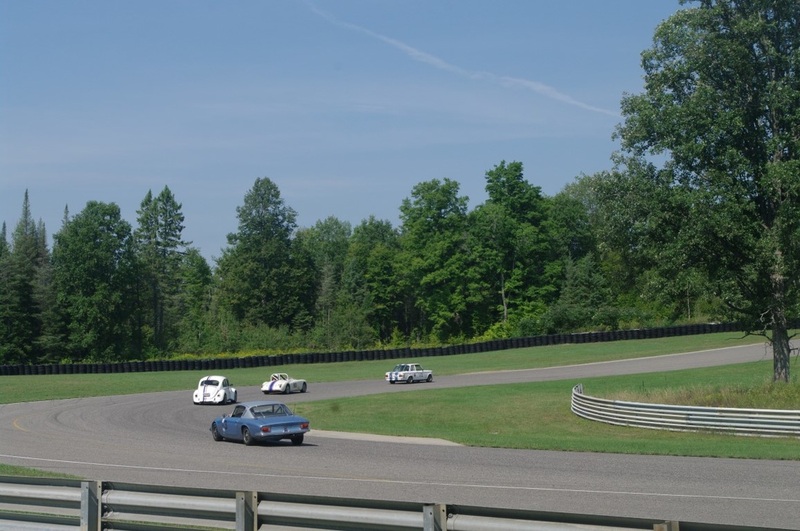 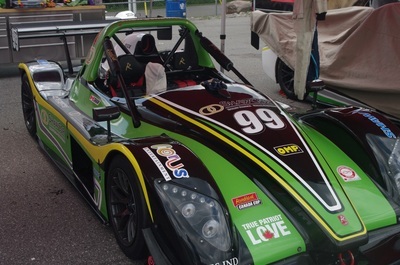 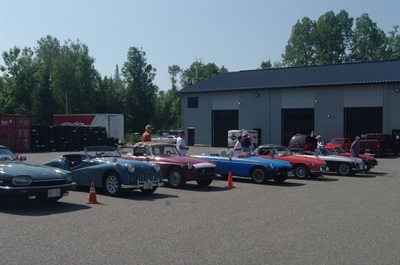 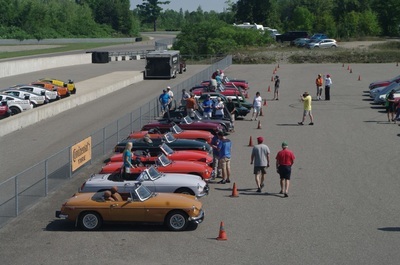 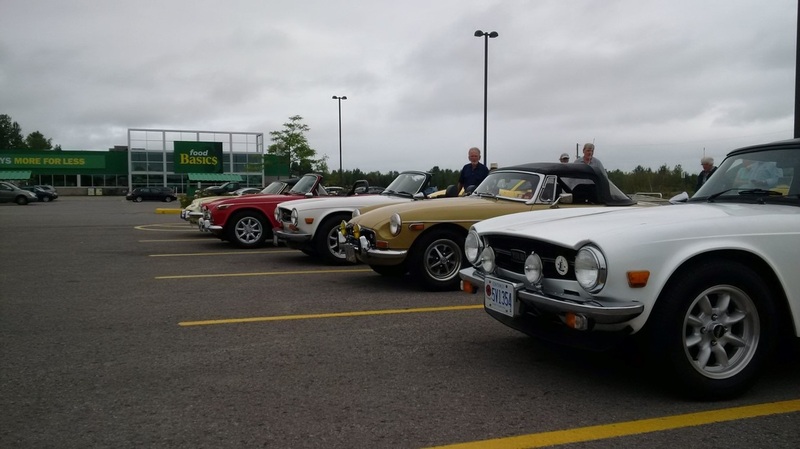 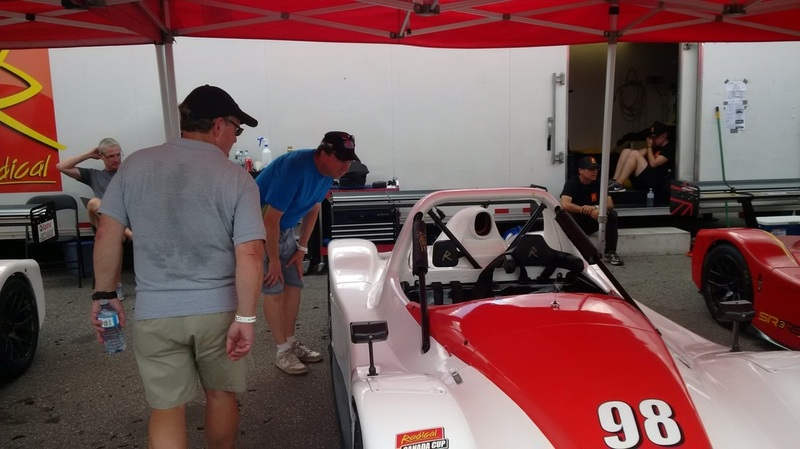 Great run with the MG Club of Ottawa, Ottawa Jaguar Club, and some MG friends from Montreal to Calabogie Motorsports Park for the Motorsport Club of Ottawa races. 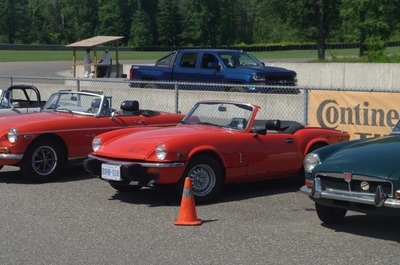 Nice day for a drive with other enthusiasts, and great fun to run a couple of parade laps of the track. 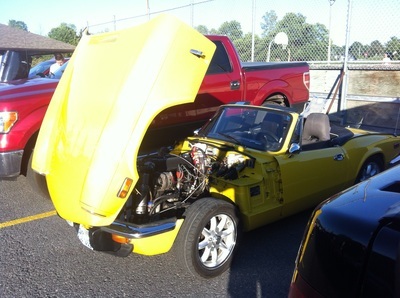 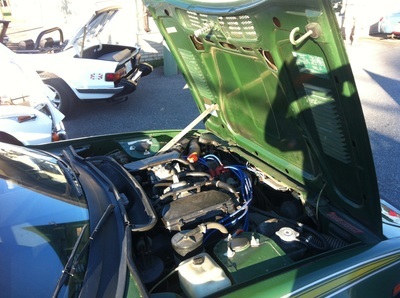 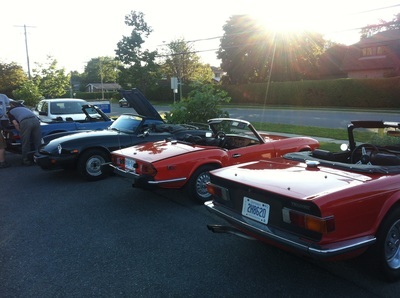 Great night for a drive and a chance to swap some Triumph parts with other members. 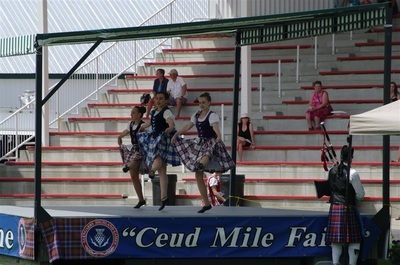 Thanks to Paul for the pictures. Good turn out of OVTC cars for the invasion this year. Drink and meal at the Cheshire Cat nice cap on the evening. Great day for the show and lots of very nice cars. OVTC represented by Bob and Fran, David and Linda, and Mike and Marjorie. 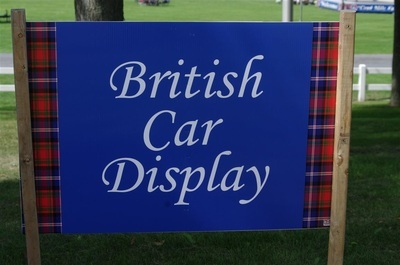 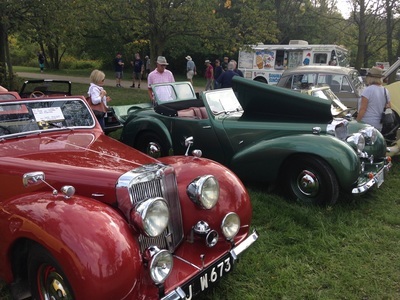 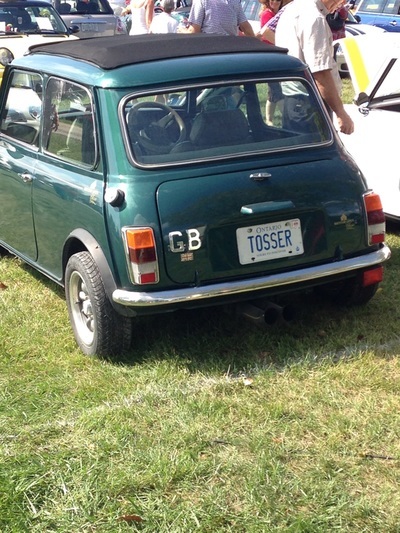 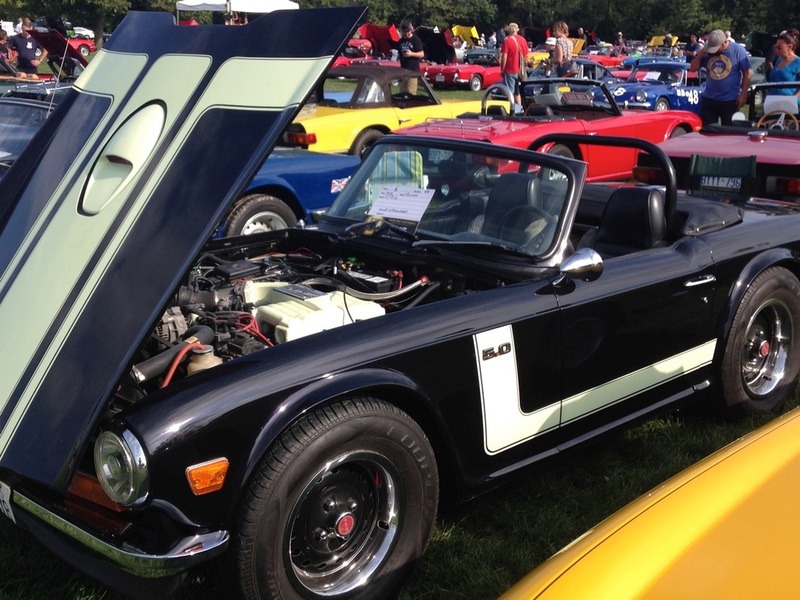 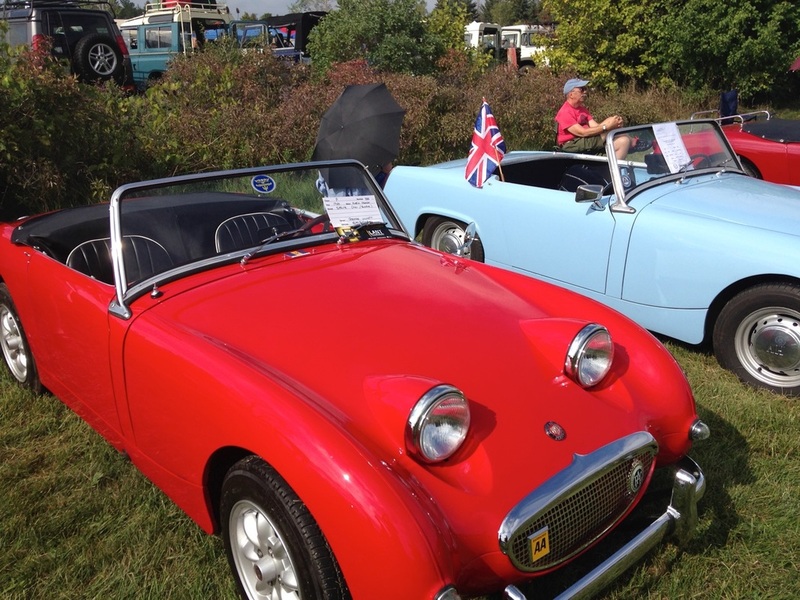 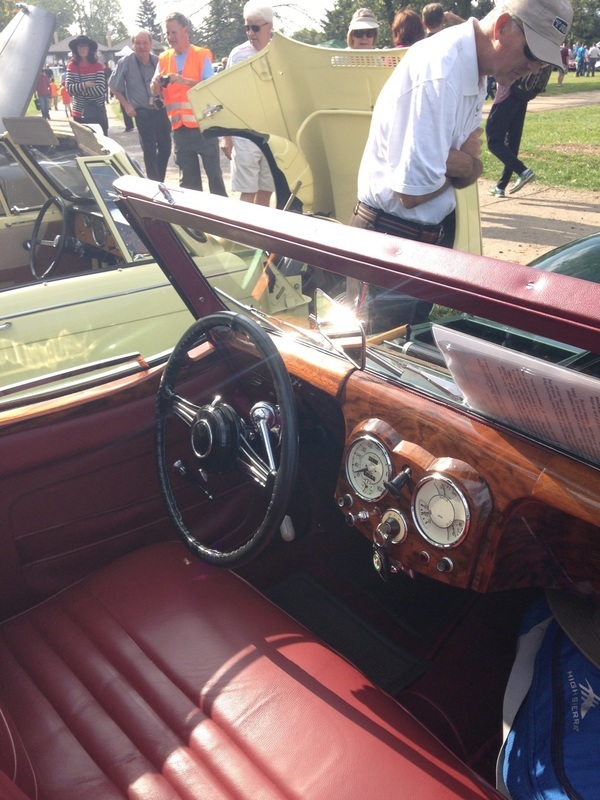 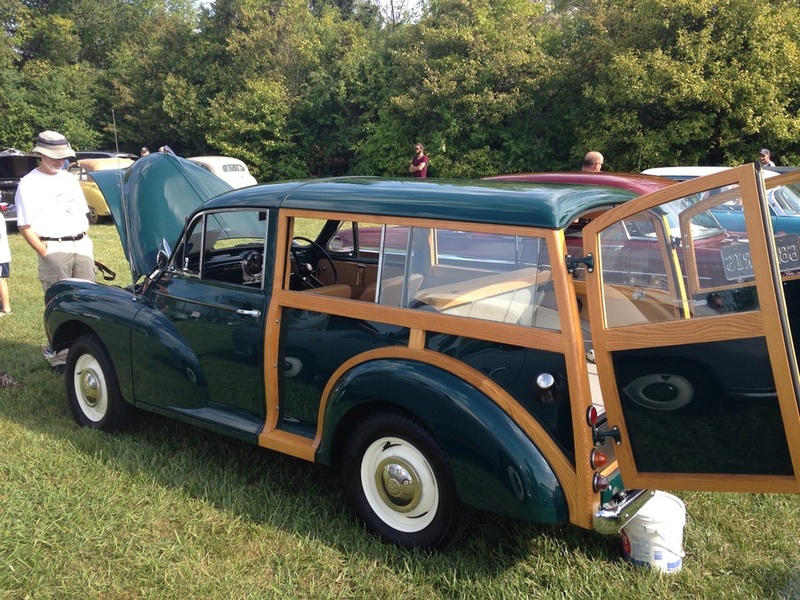 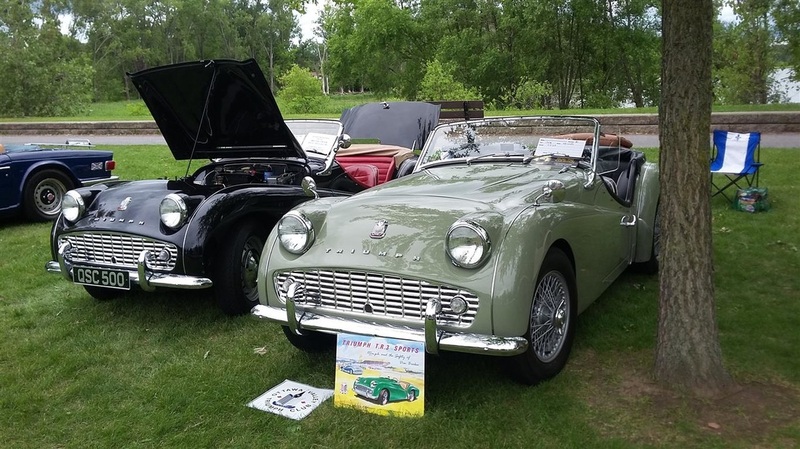 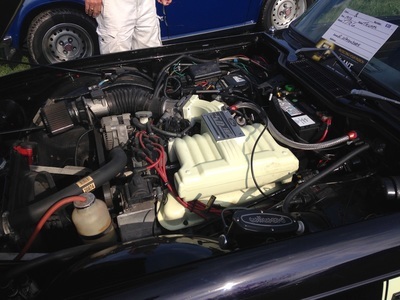 Thanks to Paul Winter for providing some pictures from his visit to the British Car Day at Bronte. 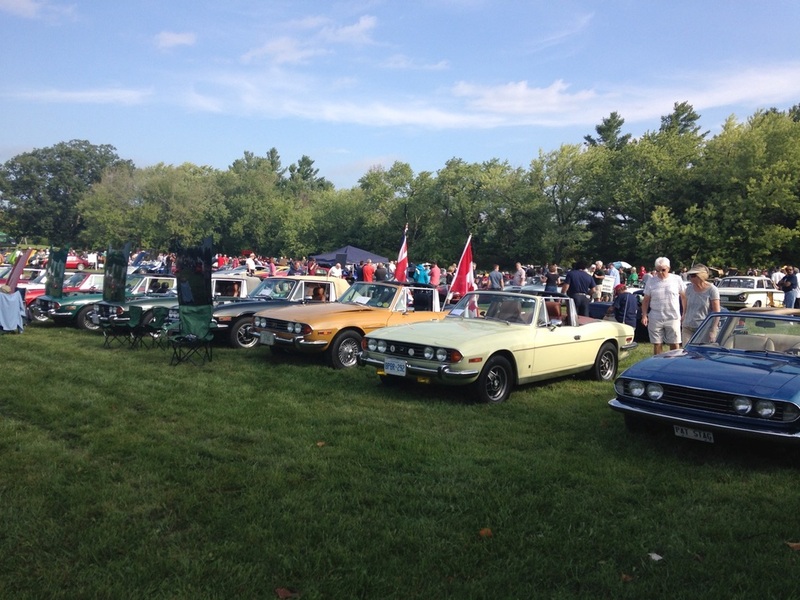 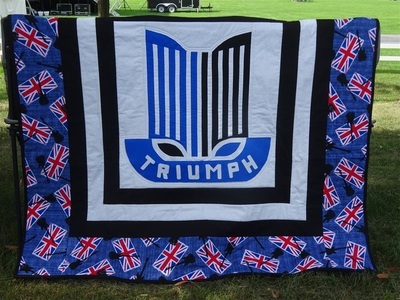 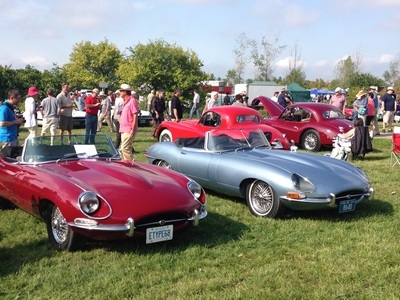 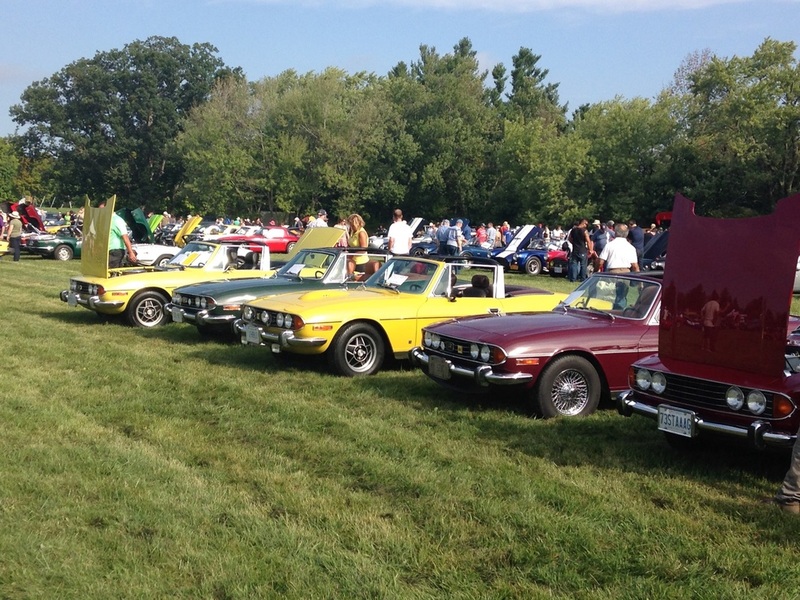 Great event organized by the Toronto Triumph Club. 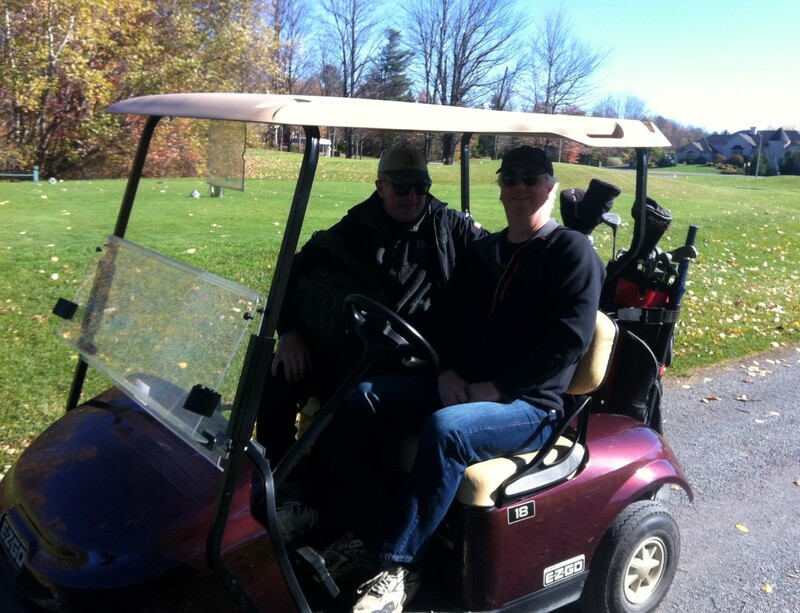 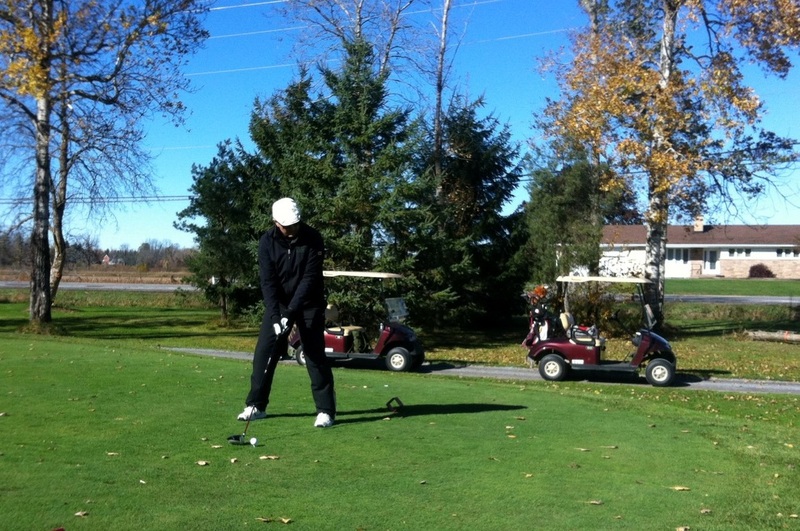 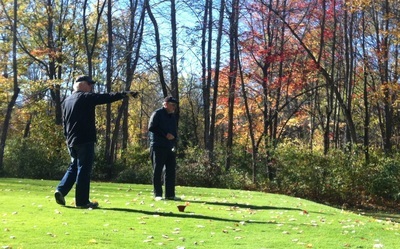 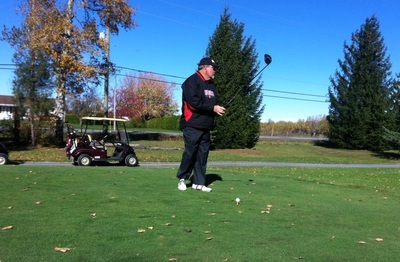 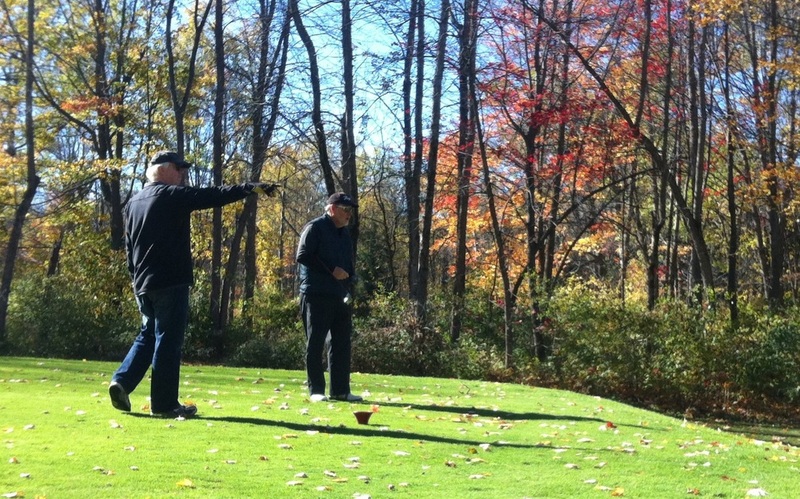 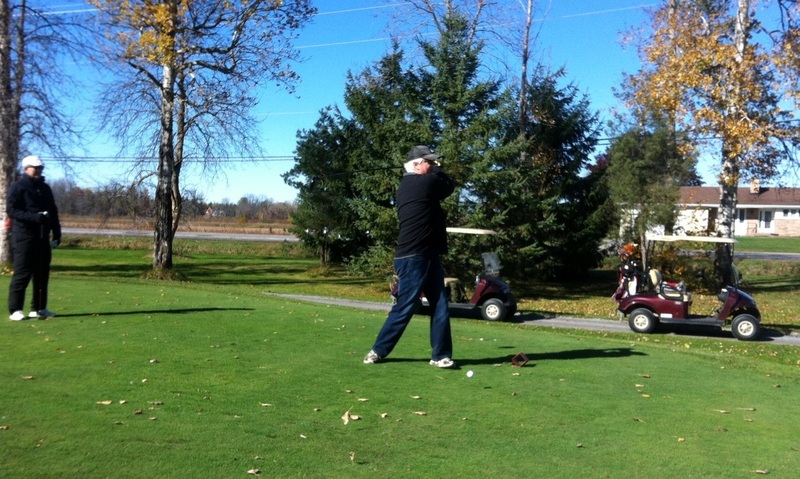 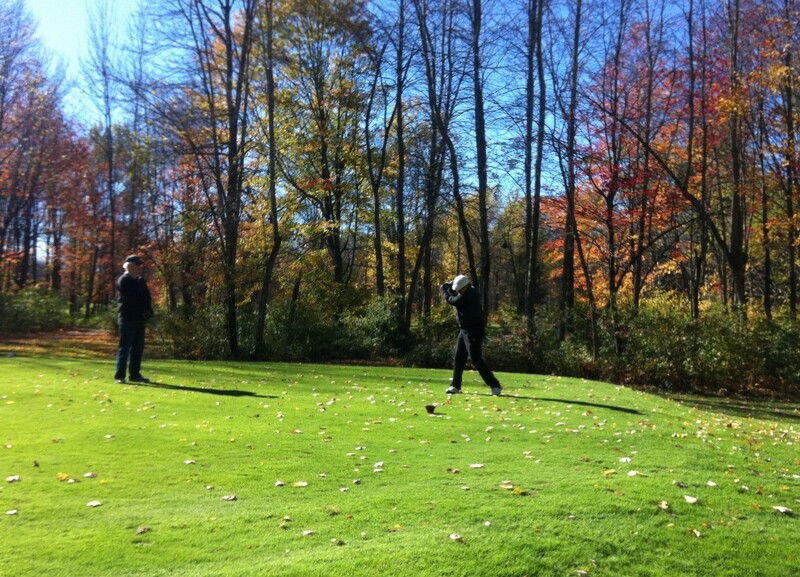 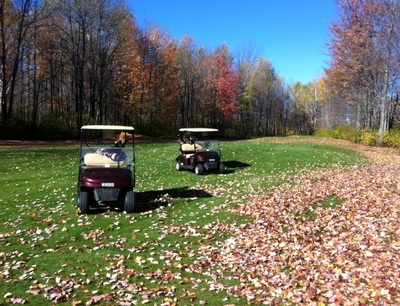 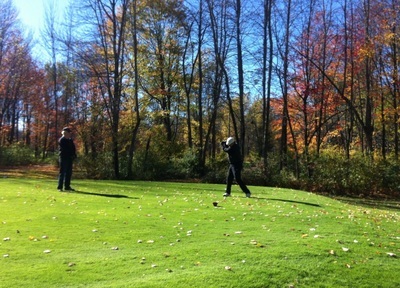 Blustery but sunny weather, with winds gusting to 70 km/h and temperatures about 10 C, greeted participants at the inaugural OVTC golf tournament. 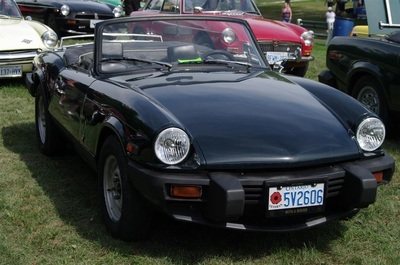 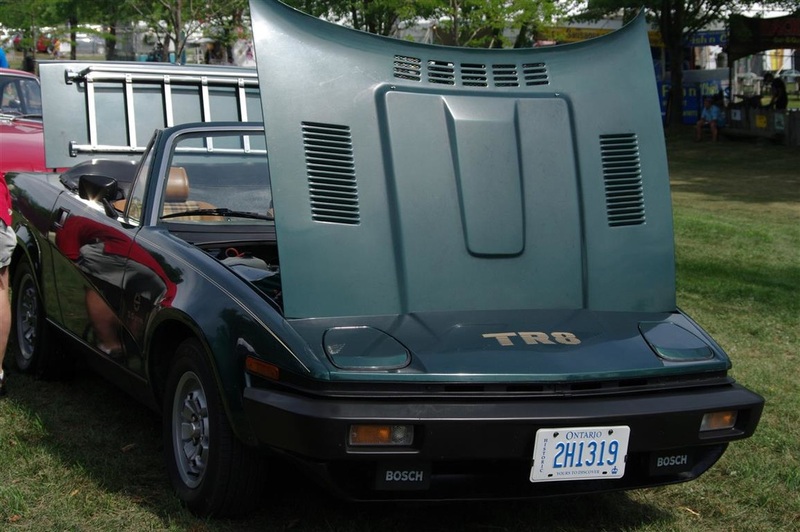 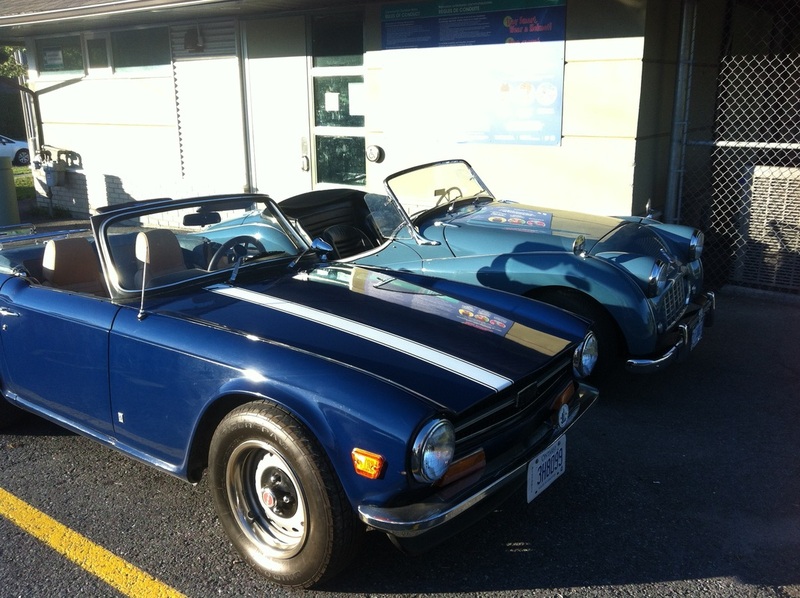 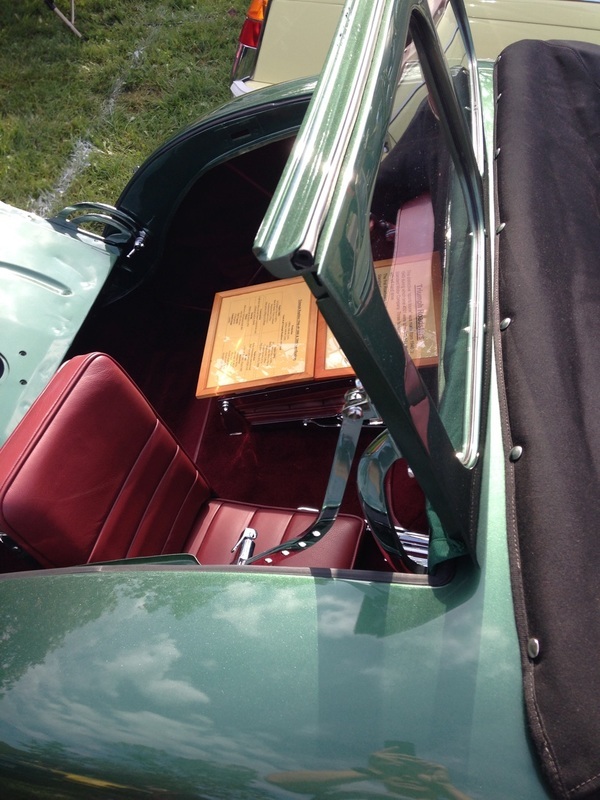 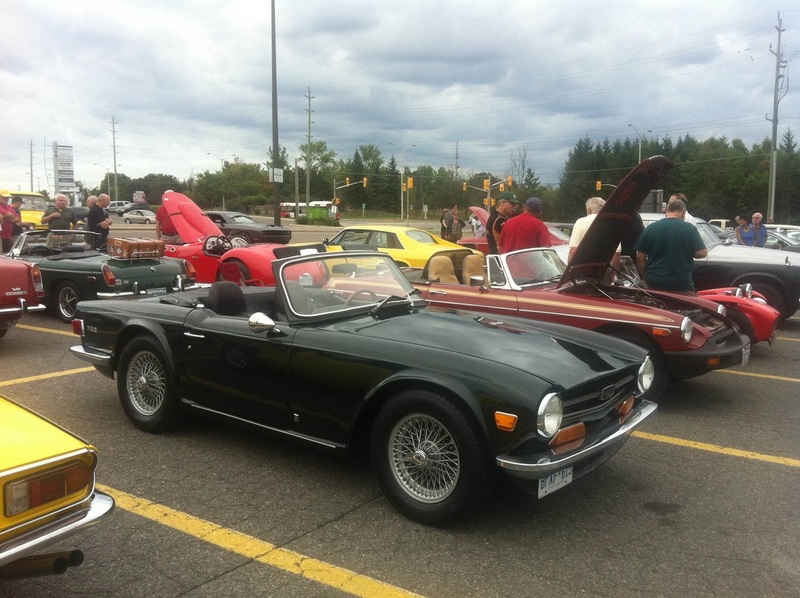 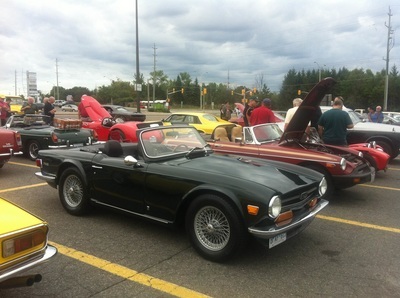 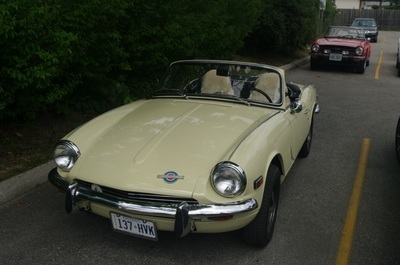 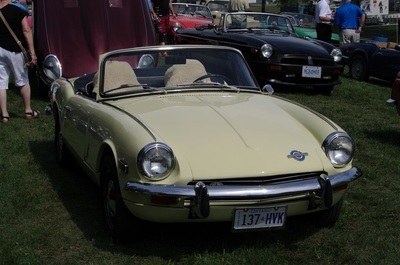 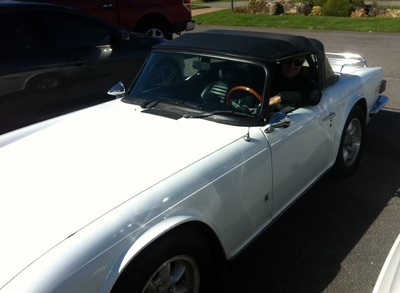 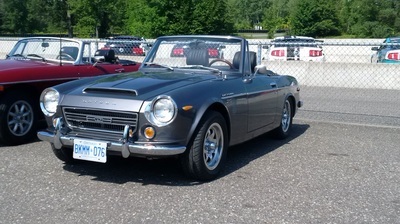 The weather did not stop some folk from driving with the top down in their Triumphs. 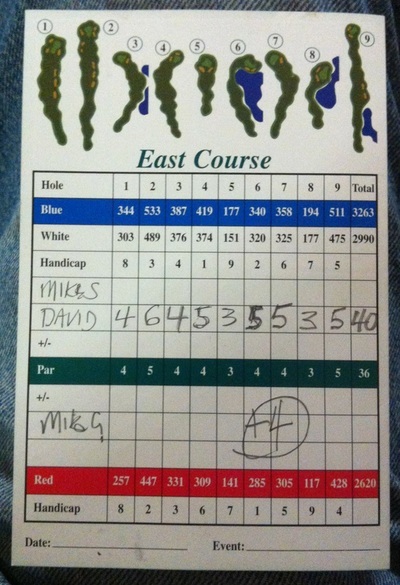 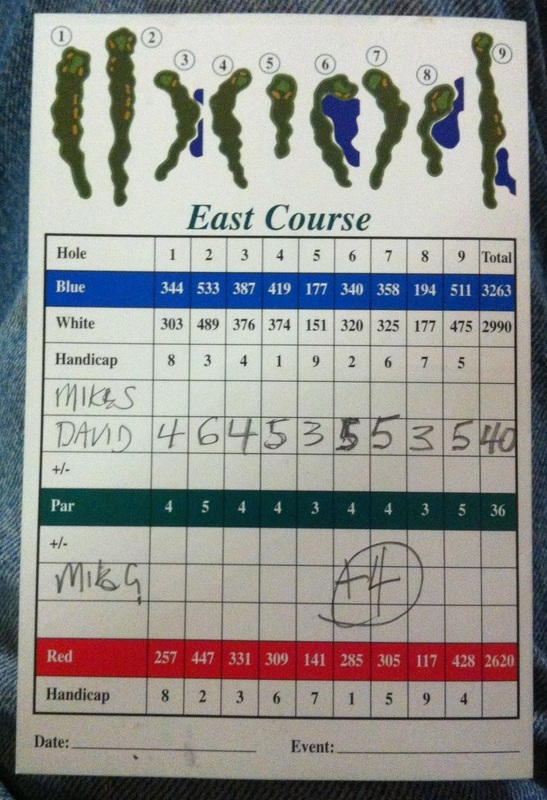 It was a closely fought battle, but in the end the team of Mike Solonynko, David Batten, and Mike Graham outdistanced the field and carded a 4-over-par 40 to claim victory. 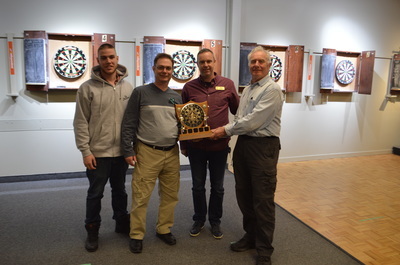 Congratulations to the winners, who are looking forward to defending their prestigious title next year. 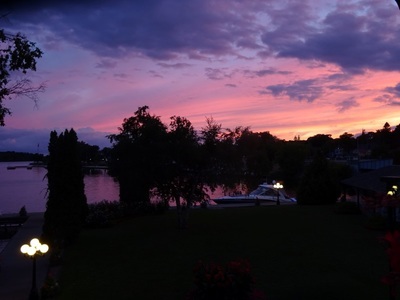 Thanks to Mike S. and Paul W. for contributing the pictures and to Chuck for an informative presentation. 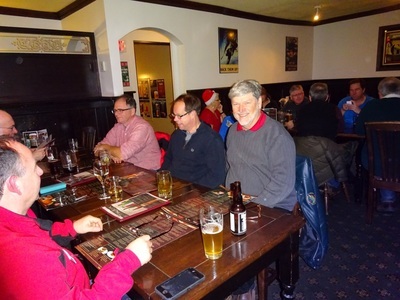 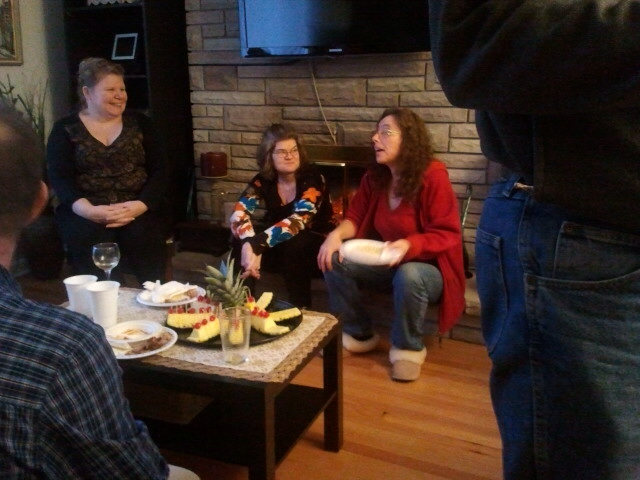 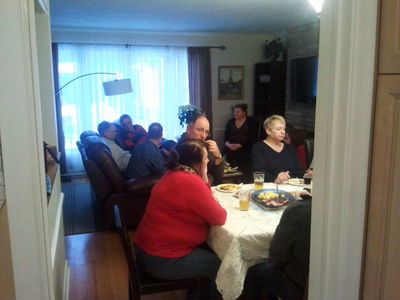 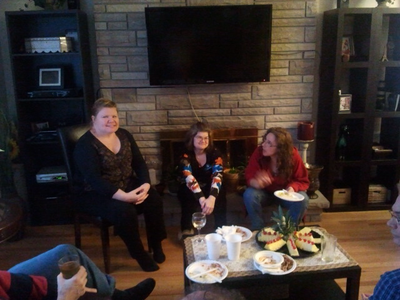 Good turn out for our annual Christmas Party on 13 December.